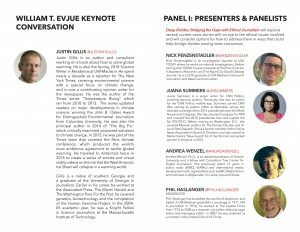 The keynote conversation with Justin Gillis asked how science writers can accurately convey both uncertainty about research and certainty about scientific consensus. 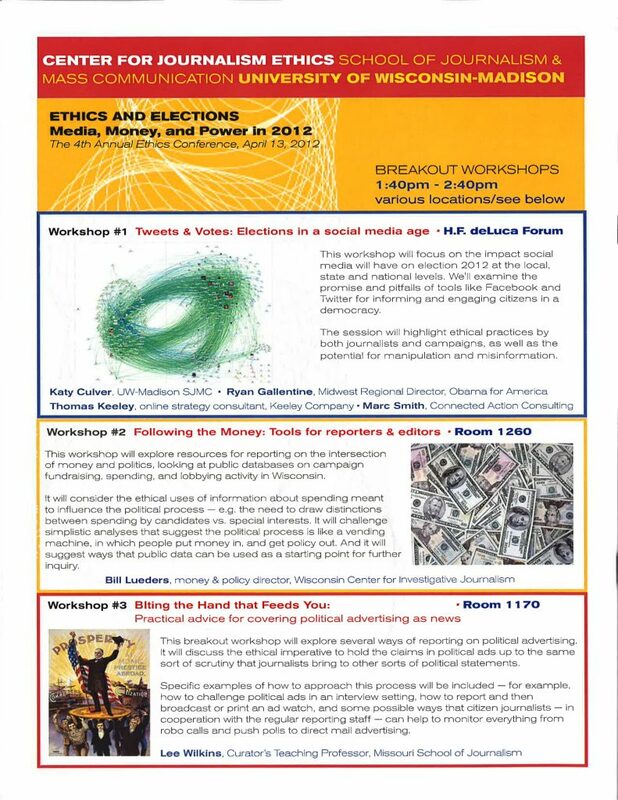 Nick Penzenstadler (USA Today), Juana Summers (CNN Politics) and Andrea Wenzel (Temple University) explore several current news stories with an eye to the ethical issues involved and consider options for how to address them in ways that could help bridge divides among news consumers. 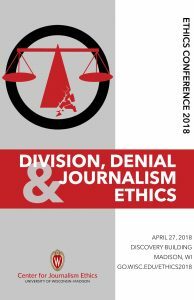 Stephanie Edgerly (Northwestern University), Lucas Graves (UW–Madison) and Michelle Holmes (Alabama Media Group) consider the routines and incentives of journalists and the psychology of the audience that grows conspiracies, values the wisdom of the mob and limits public debate on policies. 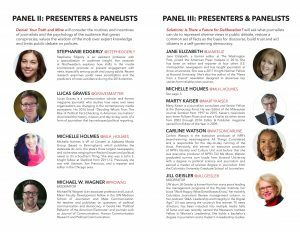 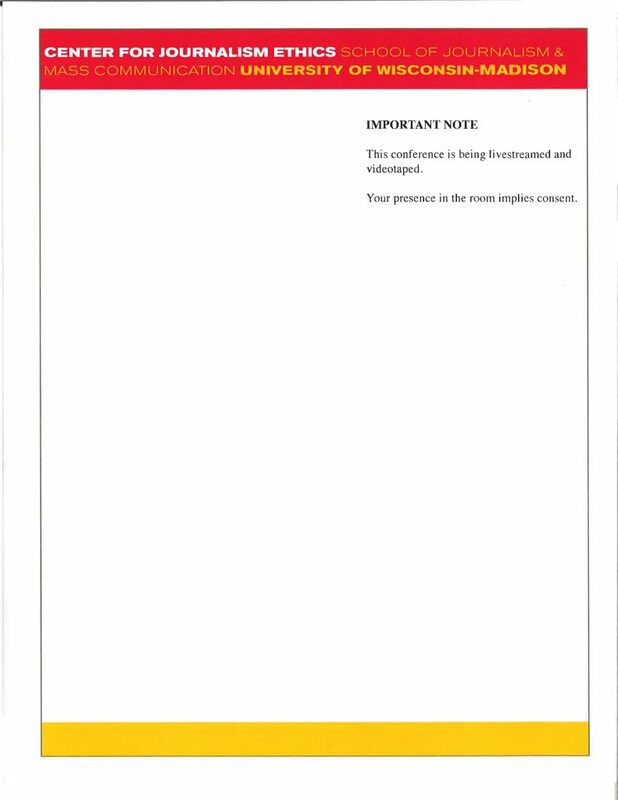 SESSION 3 – is there a future for deliberation? 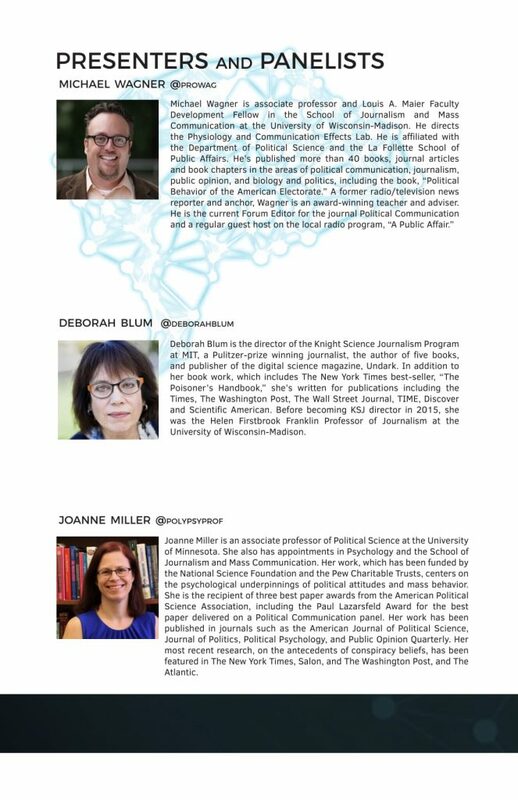 Jane Elizabeth (American Press Institute), Michelle Holmes (Alabama Media Group), Marty Kaiser (Democracy Fund) and Carline Watson (NPR) discuss what journalists can do to represent diverse views in public debate, restore a common set of facts as the basis for discourse, build trust and aid citizens in a self-governing democracy. 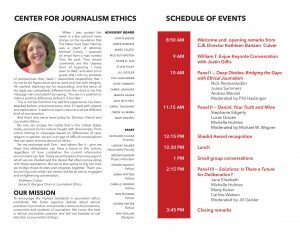 Margaret Sullivan (Washington Post) talked with Center director Kathleen Culver for this keynote conversation. 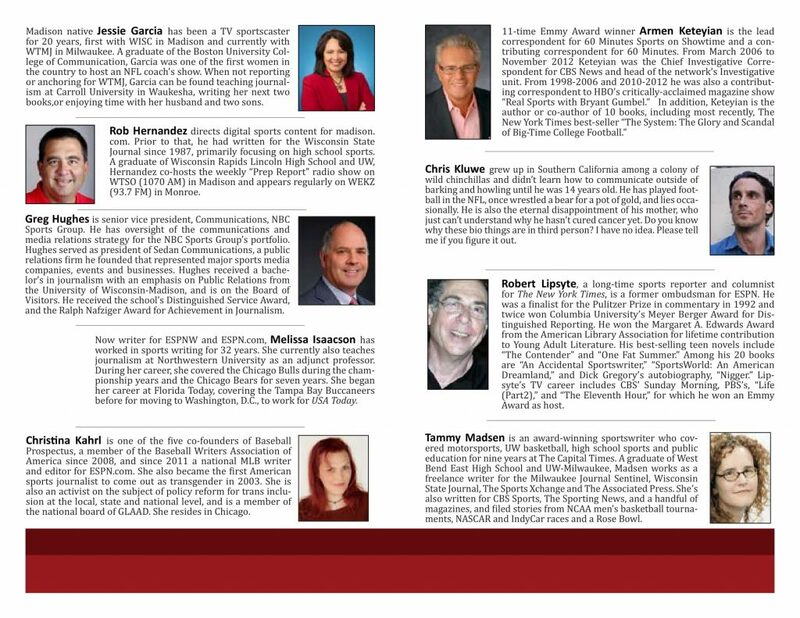 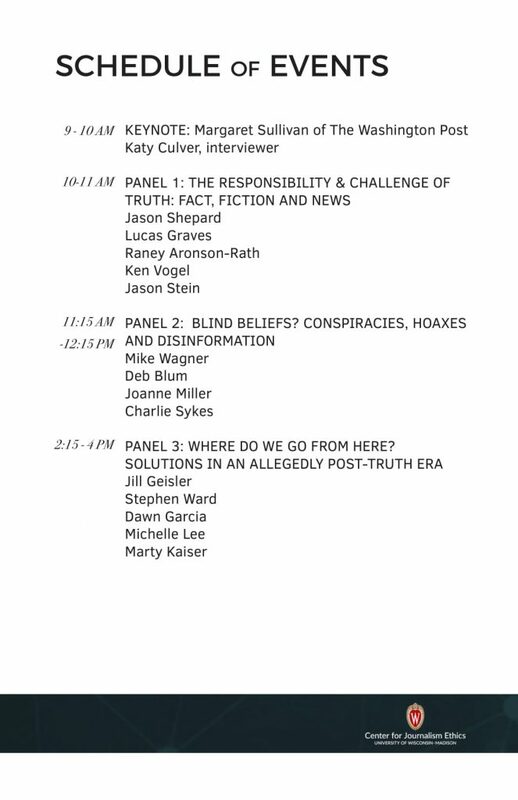 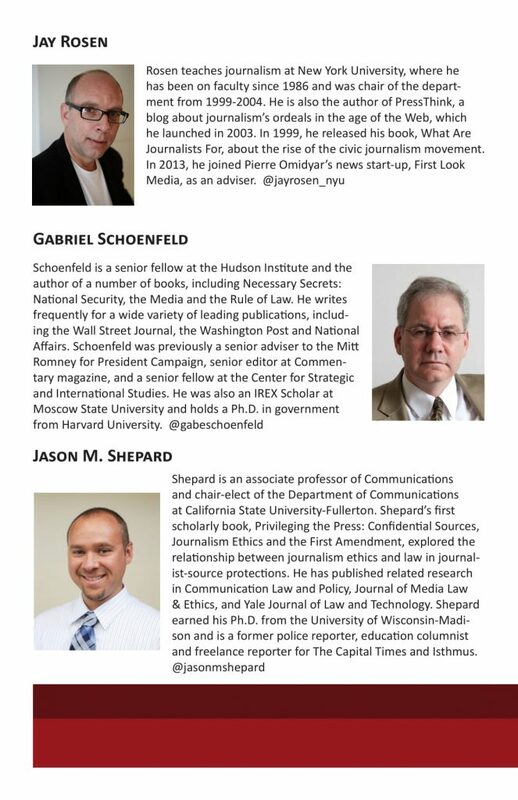 Moderated by Jason Shepard (California State University -Fullerton). 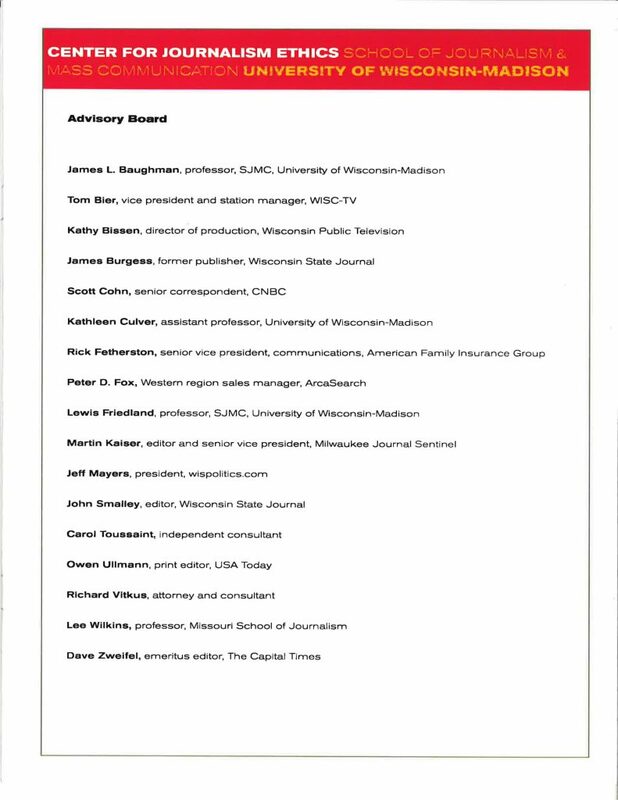 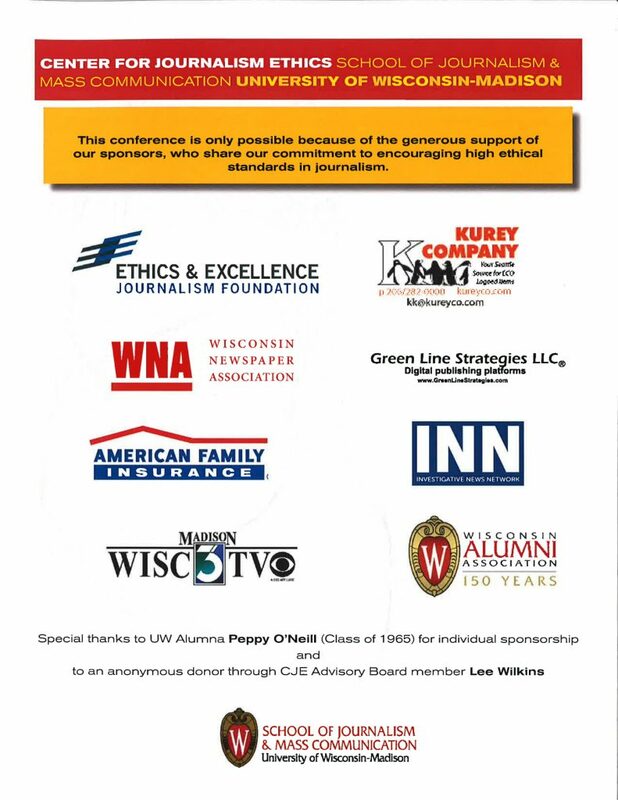 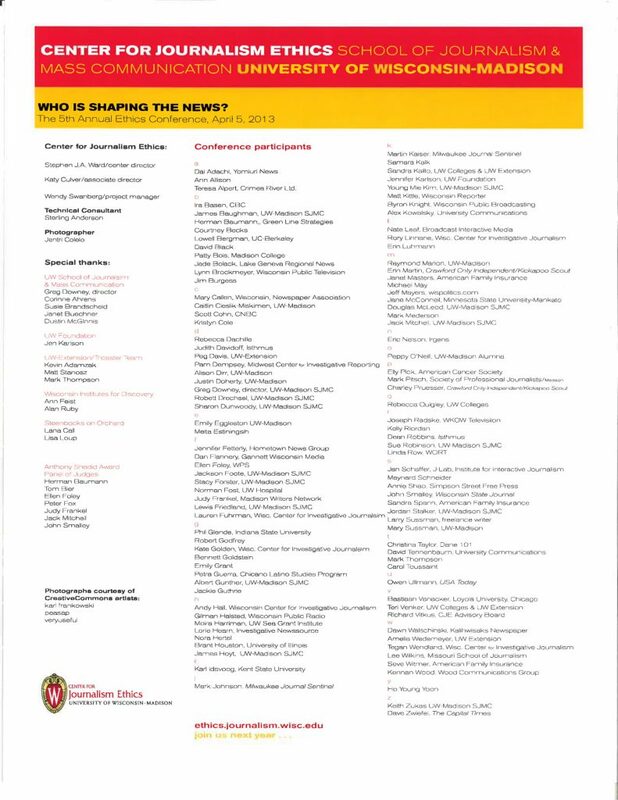 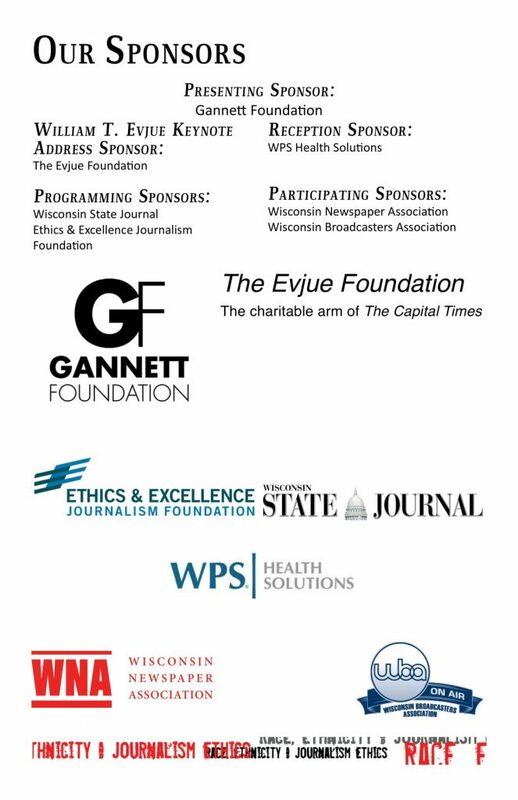 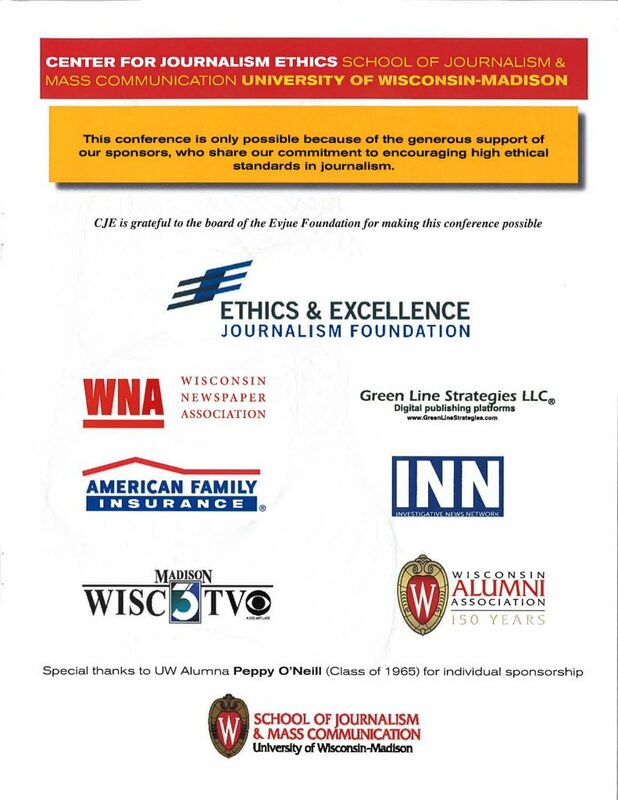 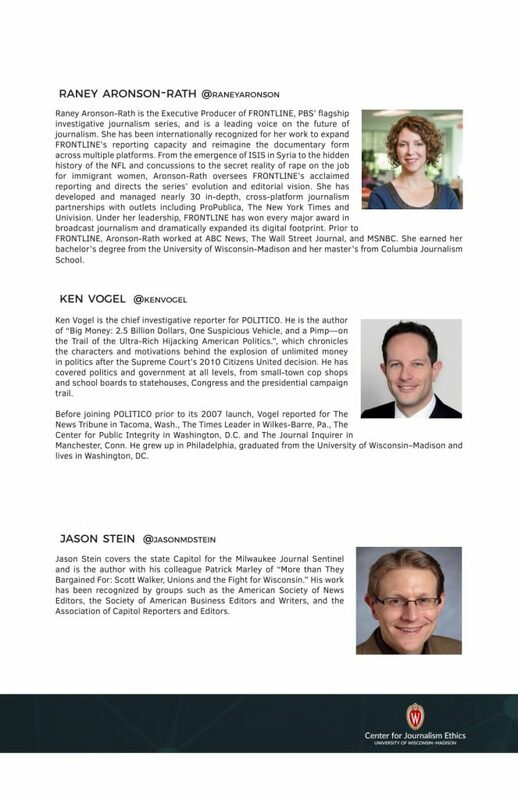 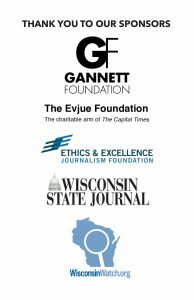 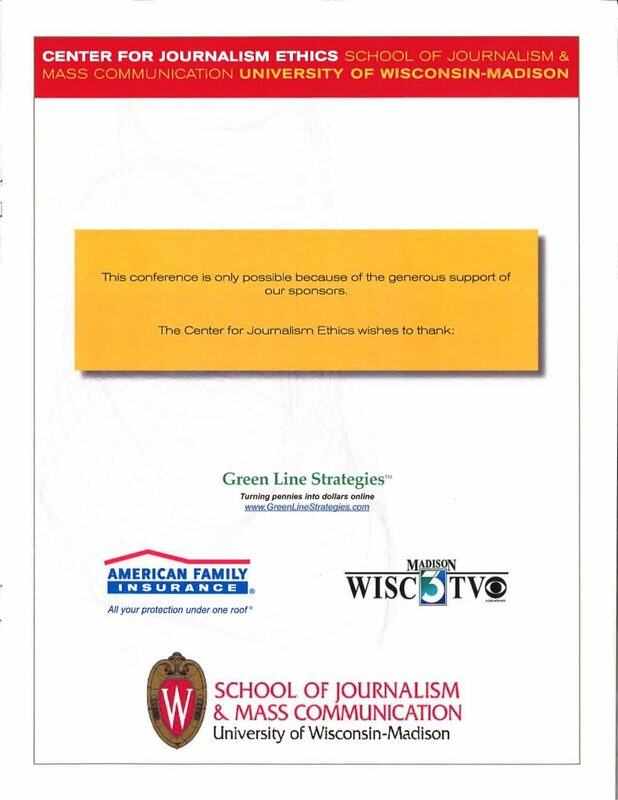 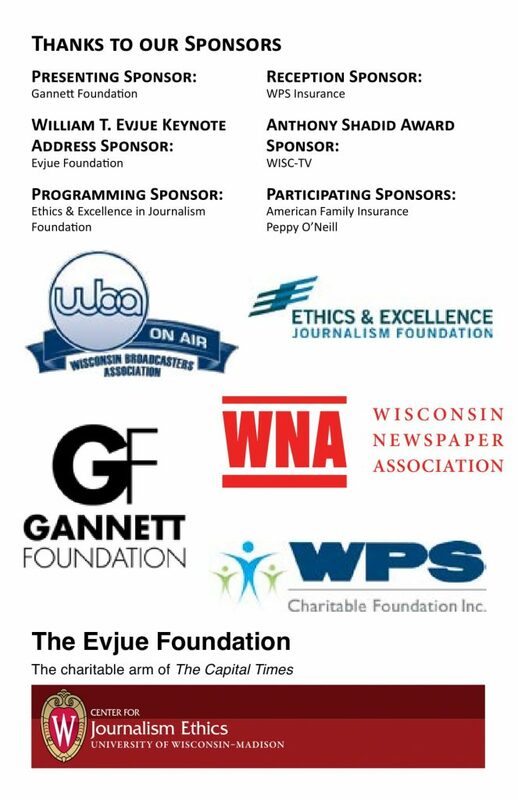 Panelists: Lucas Graves (University of Wisconsin-Madison), Ken Vogel (Politico), Raney Aronson-Rath (PBS FRONTLINE) and Jason Stein (Milwaukee Journal Sentinel). 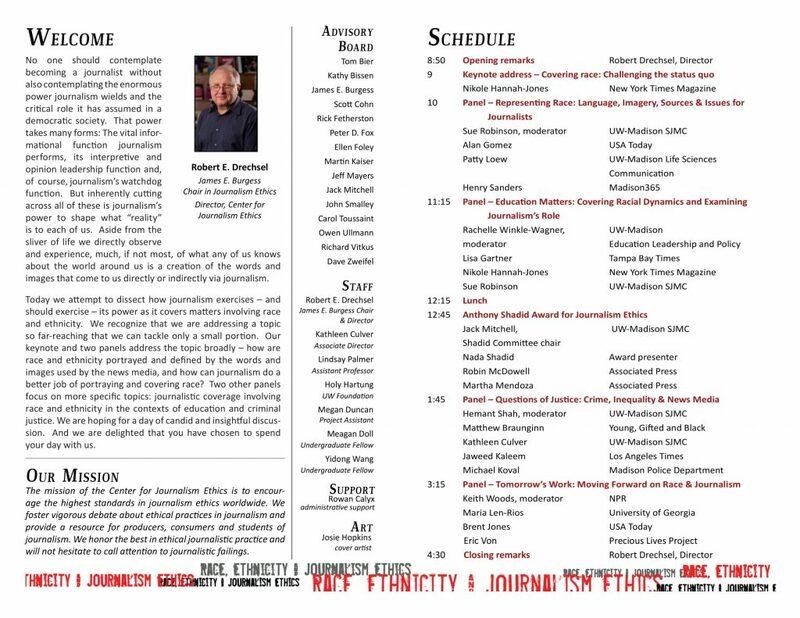 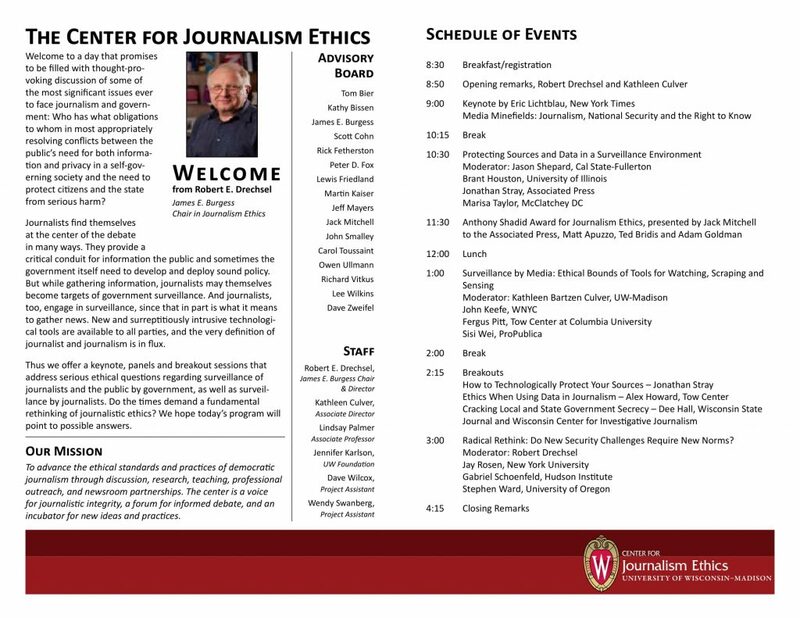 Moderated by Michael Wager (University of Wisconsin-Madison). 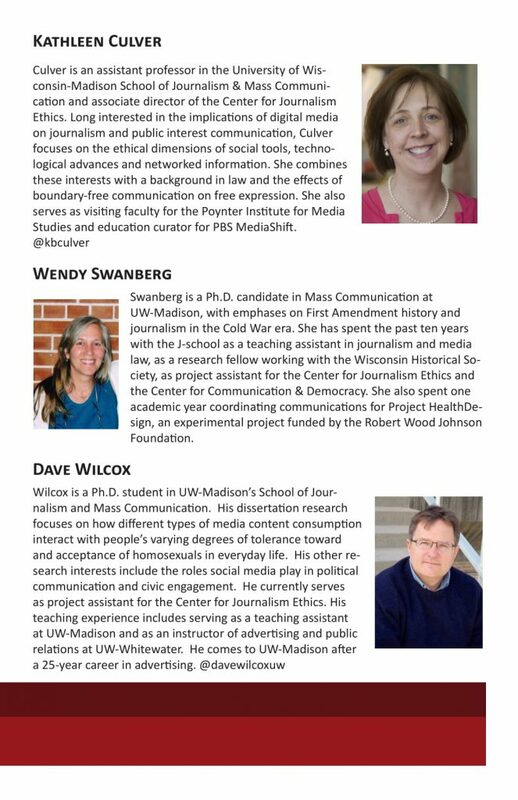 Panelists: Deborah Blum (MIT), Charlie Sykes (RightWisconsin), Joanne Miller (University of Minnesota). 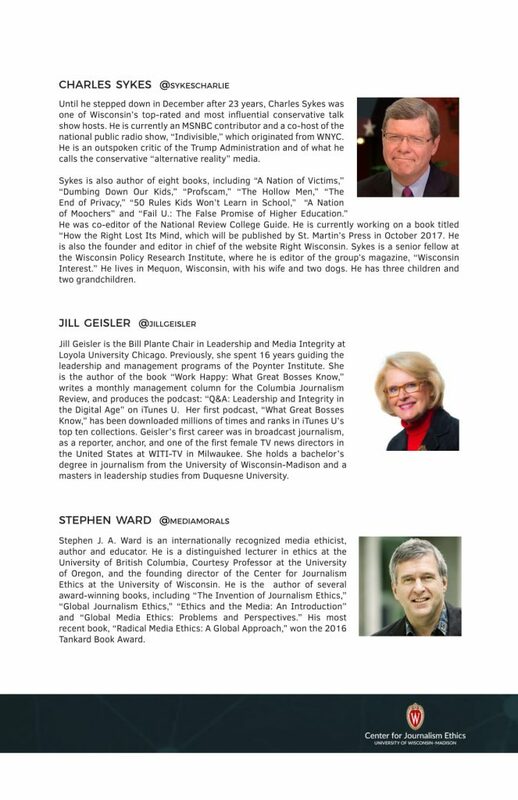 Moderated by Jill Geisler (Loyola University Chicago). 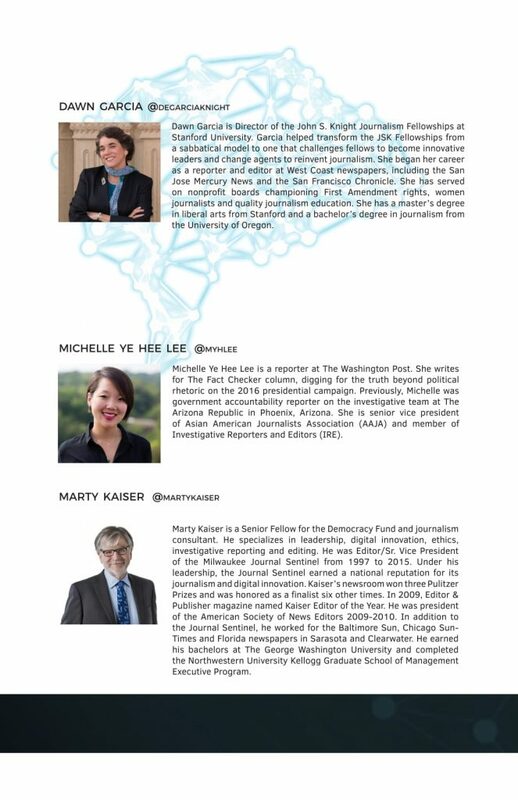 Panelists: Michelle Ye Hee Lee (Washington Post), Stephen Ward (University of British Columbia), Dawn Garcia (Stanford) and Marty Kaiser (Democracy Fund). 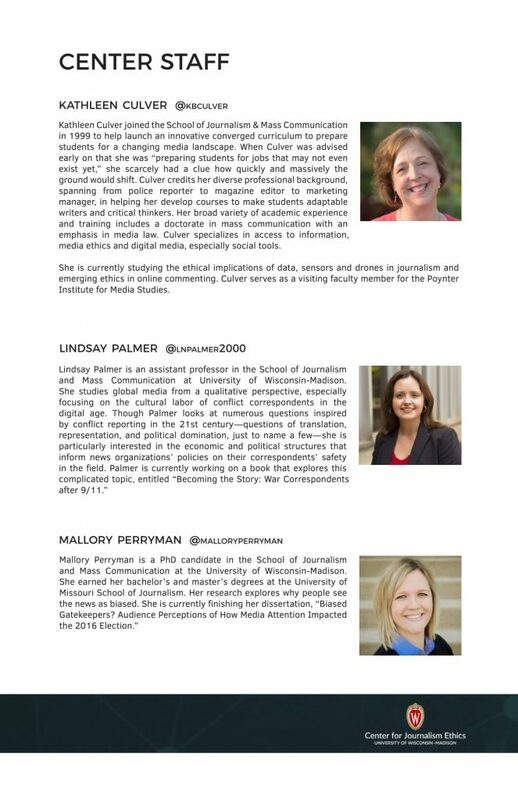 Rachel Winkle-Wagner (UW–Madison) moderates a panel with Lisa Gartner (Tampa Bay Times), Nikole Hannah-Jones (New York Times Magazine) and Sue Robinson (UW-Madison). 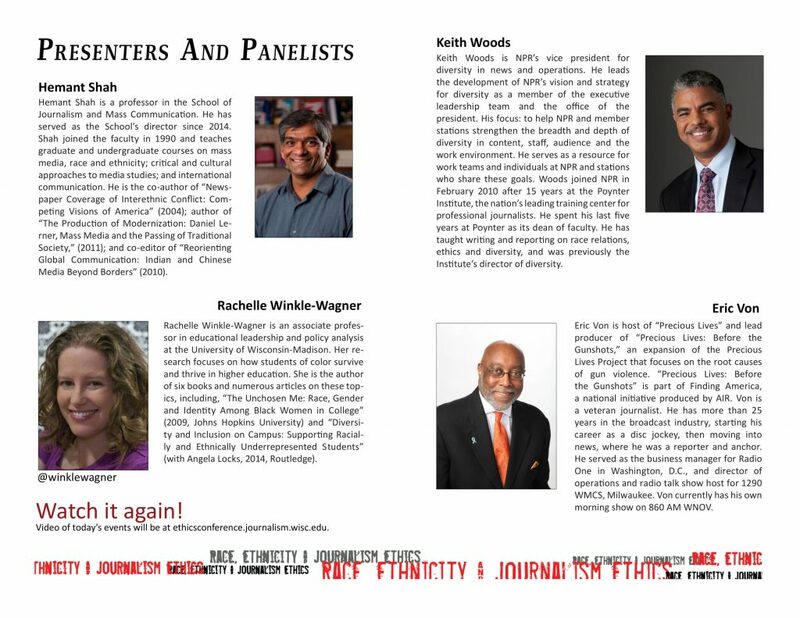 Hemant Shah (UW–Madison) moderates a panel with Mathew Braunginn (Young, Gifted and Black), Kathleen Bartzen Culver (UW–Madison), Jaweed Kaleem (Los Angeles Times) and Michael Koval (Madison Police Department). 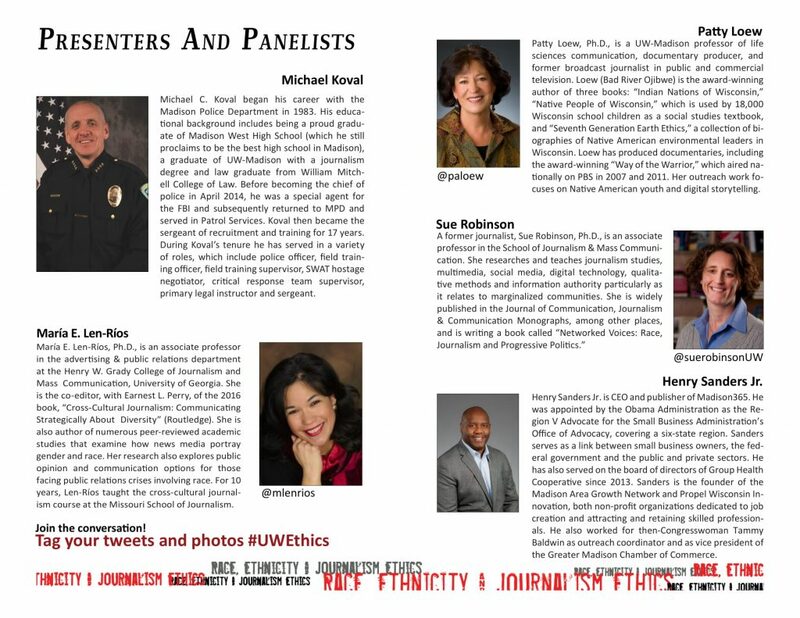 Keith Woods (NPR) moderates a panel with Maria Len-Rios (University of Georgia), Brent Jones (USA Today) and Eric Von (Precious Lives Project). 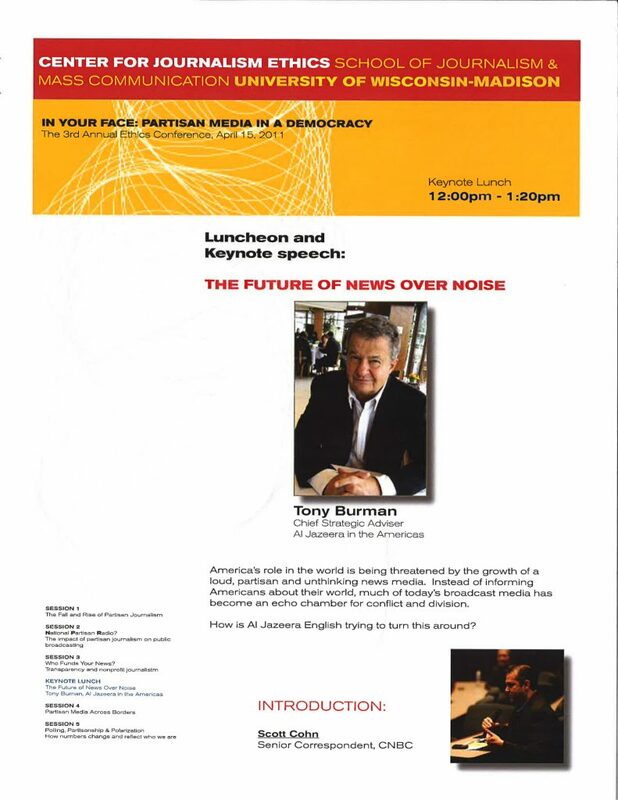 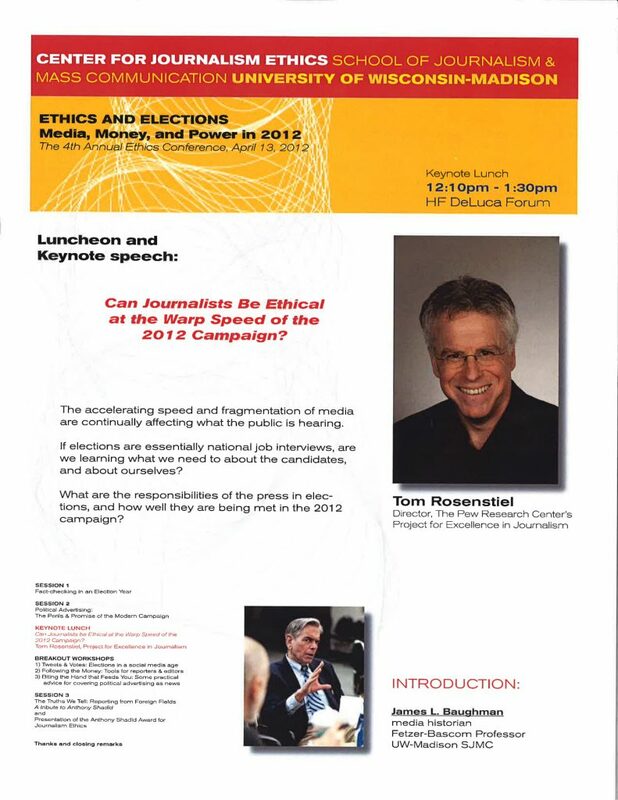 Longtime sports reporter and columnist for the New York Times Robert Lipsyte delivers the keynote speech. 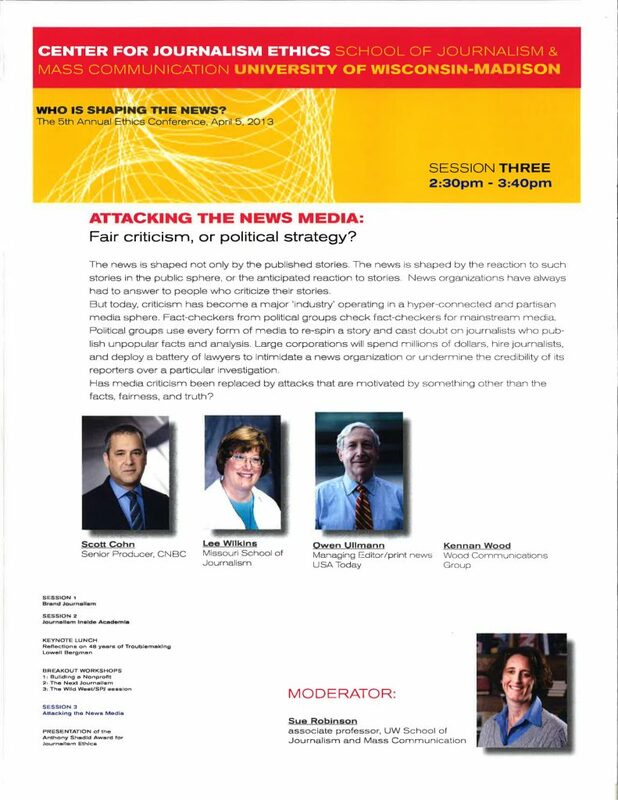 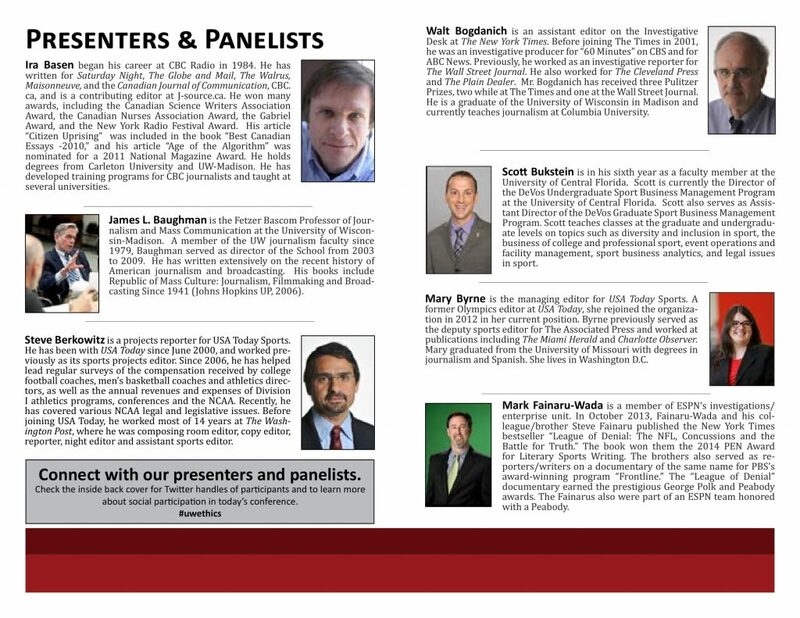 Walt Bogdanich (New York Times), Mark Fainaru-Wada (ESPN), Ira Basen (CBC Radio) and Armen Keteyian (60 Minutes) talk about investigative reporting and sports journalism. 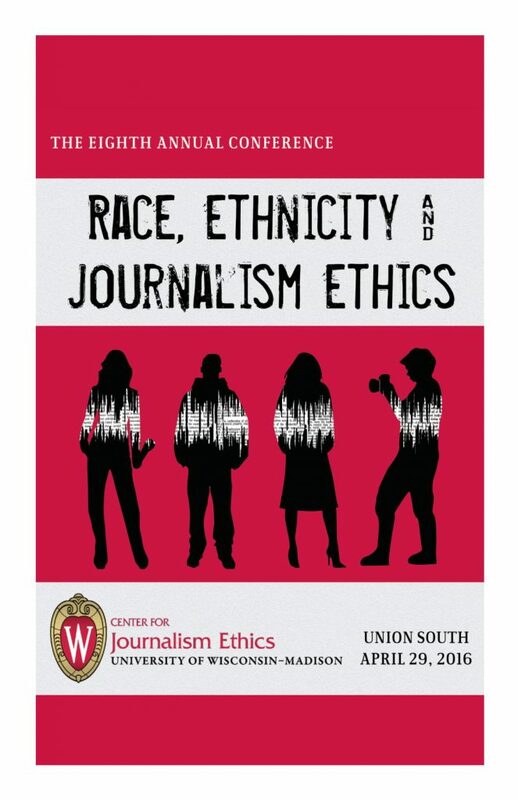 Christina Kahrl (ESPN), Jessie Garcia (WTM Milwaukee) and Scott Bukstein (University of Central Florida) discuss race, gender and sexuality in sports media. 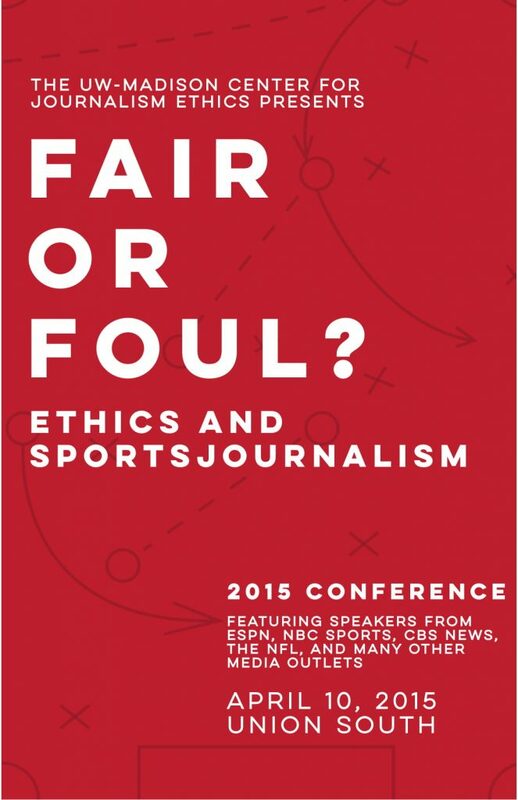 Jason Wilde (ESPN), Chris Kluwe and Melissa Isaacson (ESPN) discuss criticism and vitriol in sports journalism. 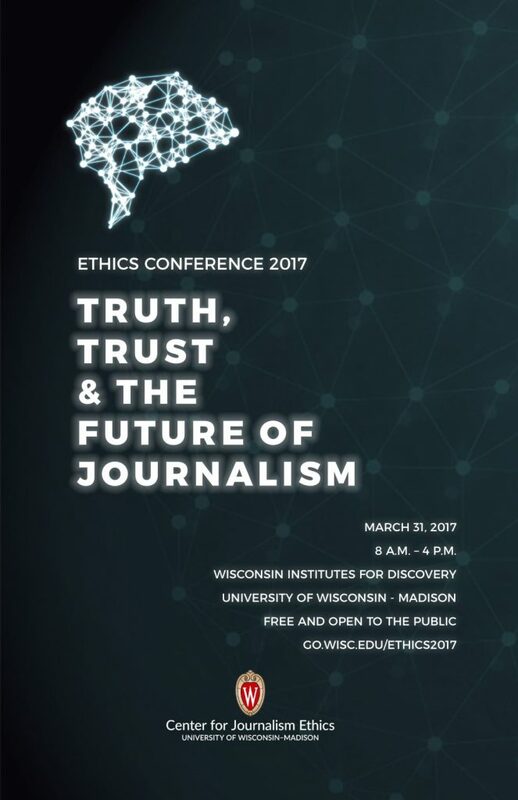 Mary Bryne (USA Today Sports), Greg Hughes (NBC Sports Group) and Jim Miller talk about ethics and the power of money in sports media. 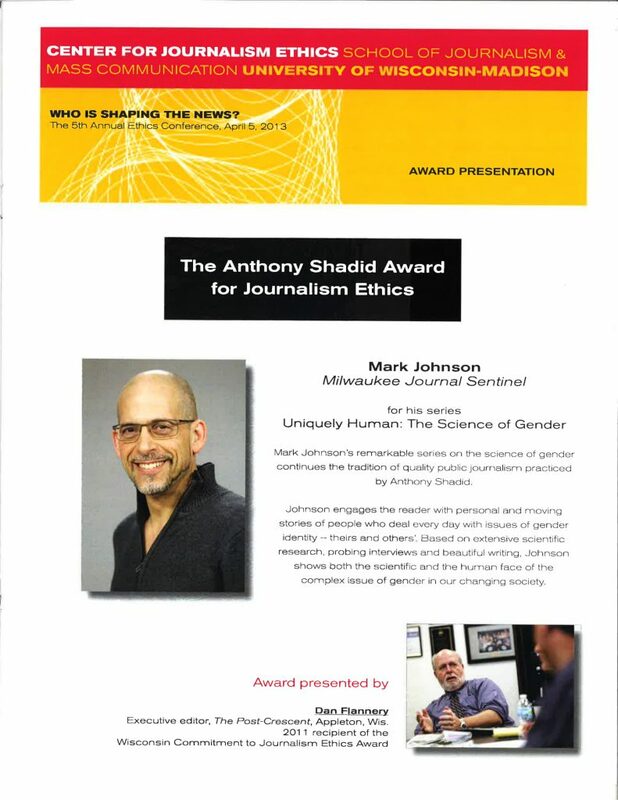 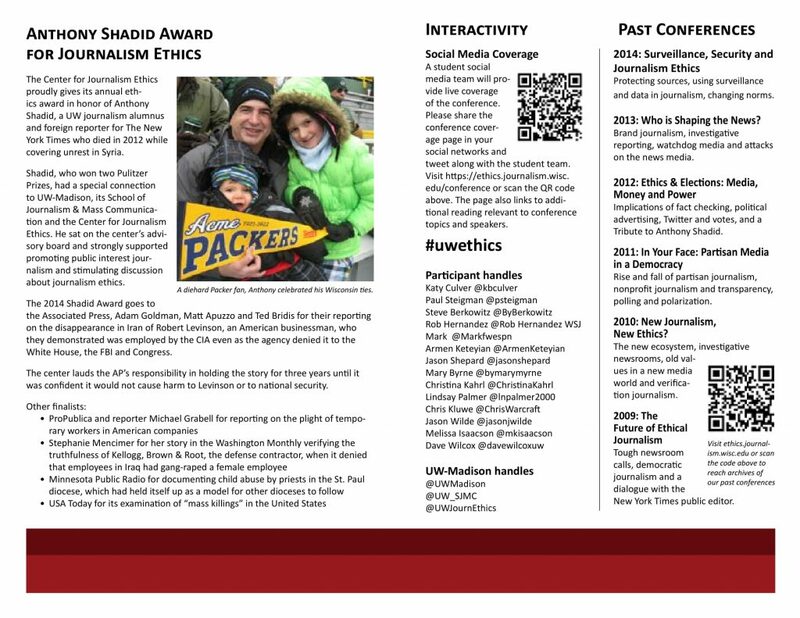 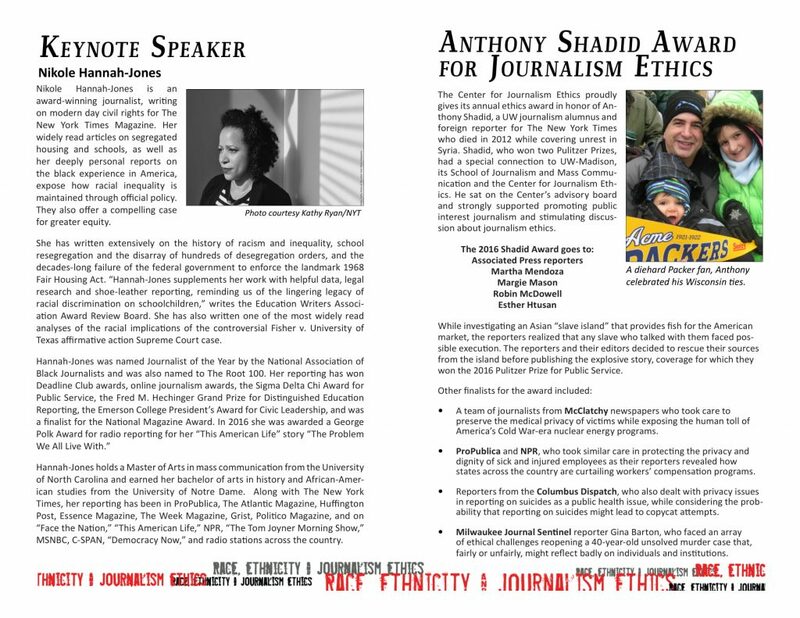 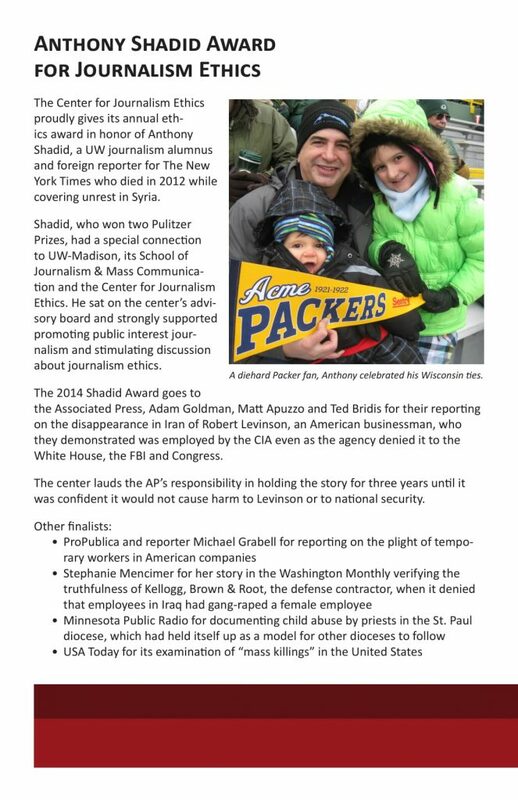 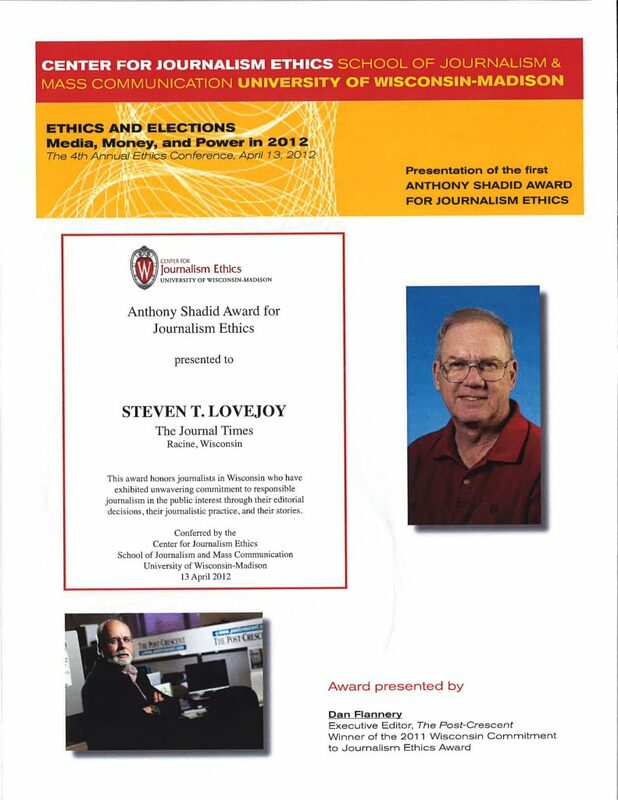 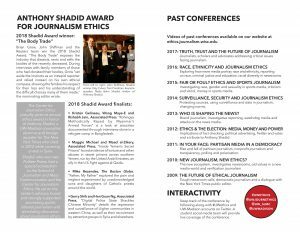 The 2015 Shadid Award for Journalism Ethics is award to Chicago Tribune reporters David Jackson, Gary Marx and Duaa Eldeib for the reporting on serious abuses in Illinois’ juvenile justice system. 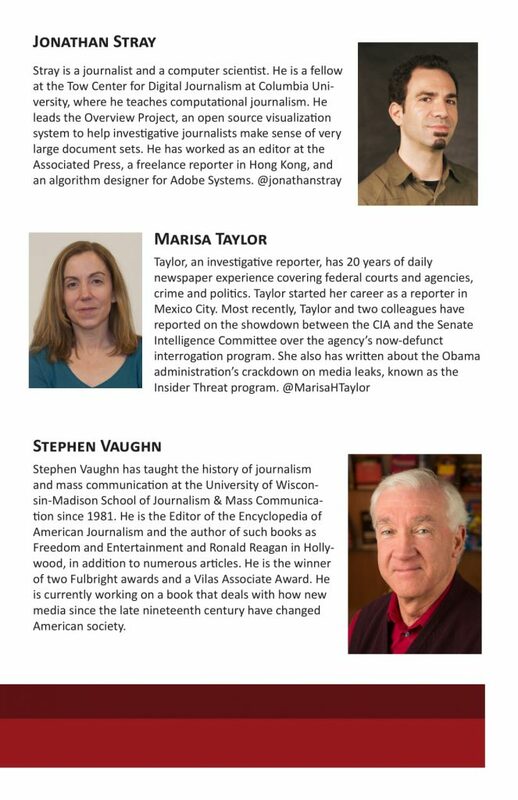 Brant Houston (University of Illinois), Jonathan Stray (Associated Press) and Marisa Taylor (McClatchey DC) discuss protecting data and resources in a surveillance environment. 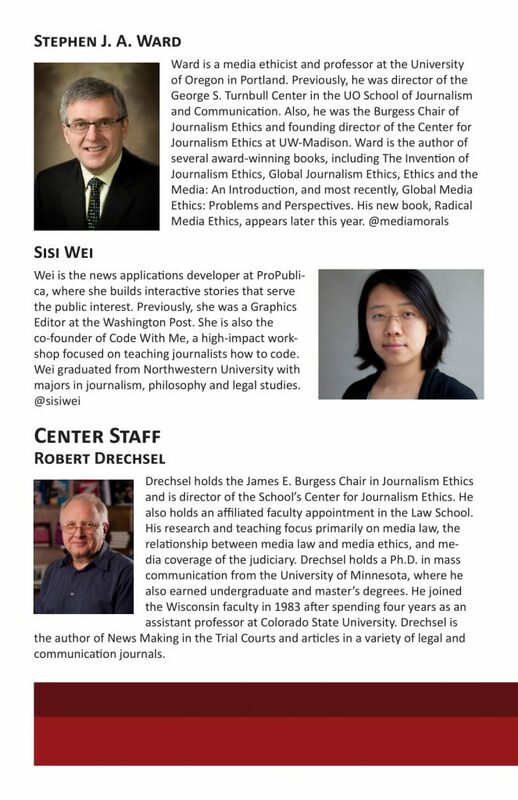 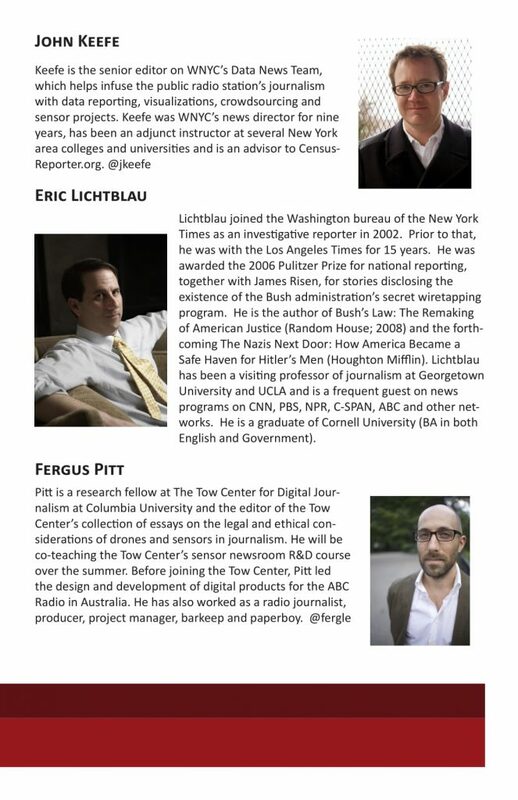 John Keefe (WNYC), Fergus Pitt (Tow Center at Columbia University) and Sisi Wei (ProPublica) discuss the ethics of surveillance by media. 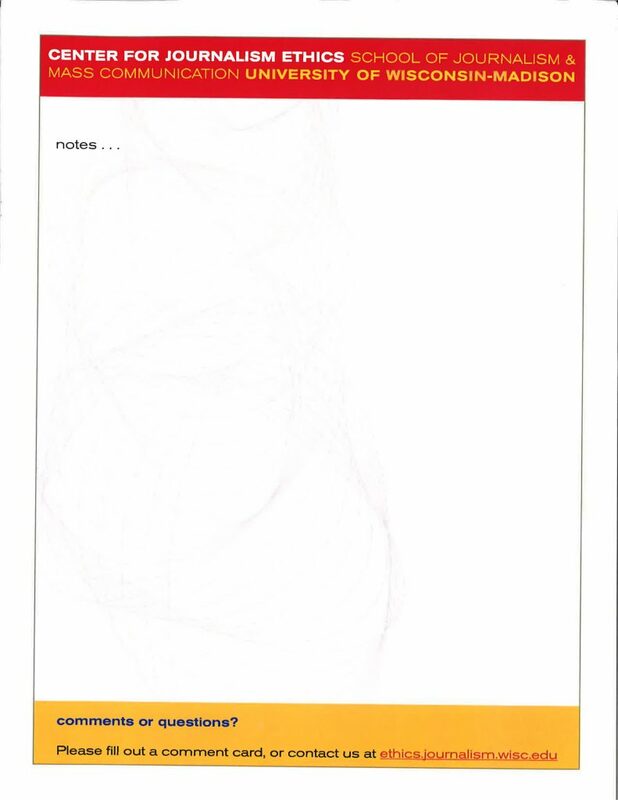 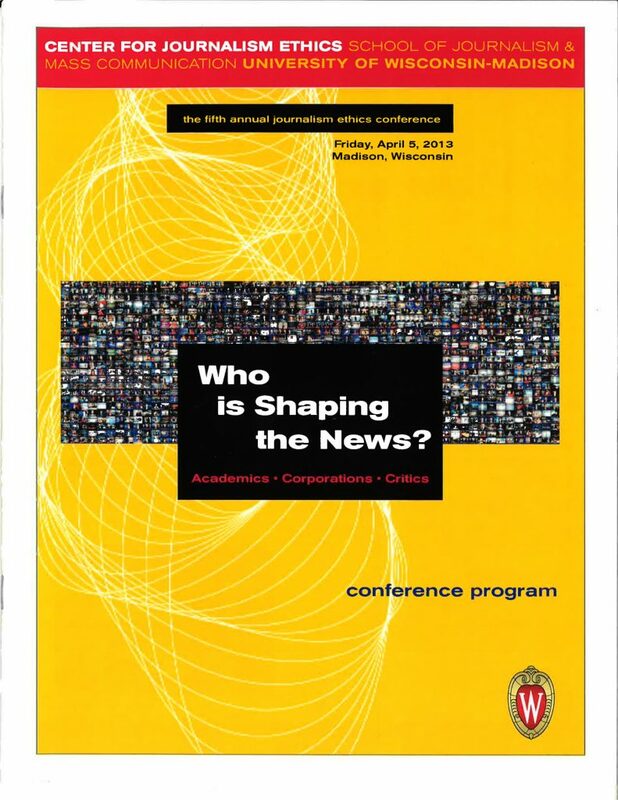 Radical Rethink – Do New Security Challenges Require New Norms? 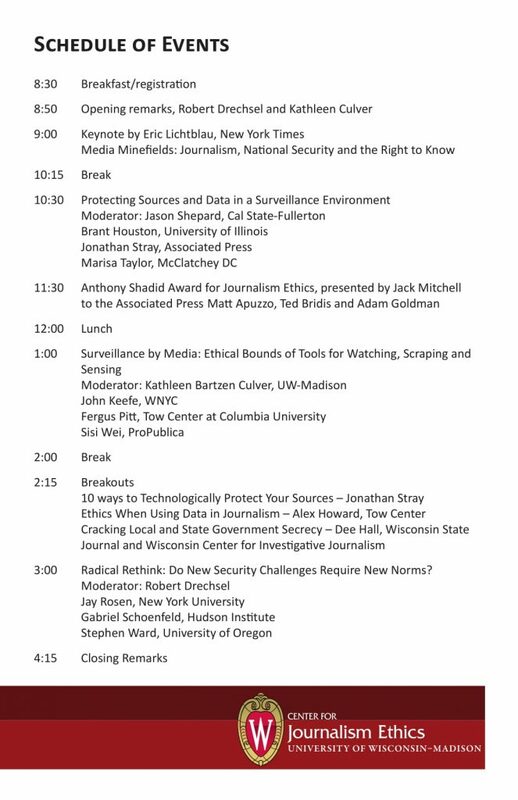 Jay Rosen (New York University), Gabriel Schoenfeld (Hudson Institute) and Stephen Ward (University of Oregon) discuss whether the surveillance environment requires new norms. 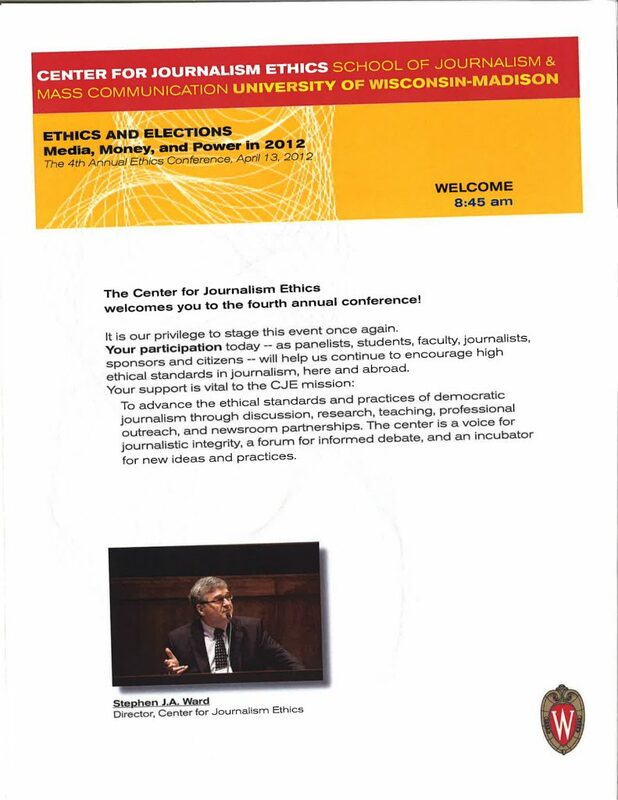 Tom Rosentiel, Director of The Pew Research Center’s Project for Excellence in Journalism, talks about the responsibilities of the press in elections. 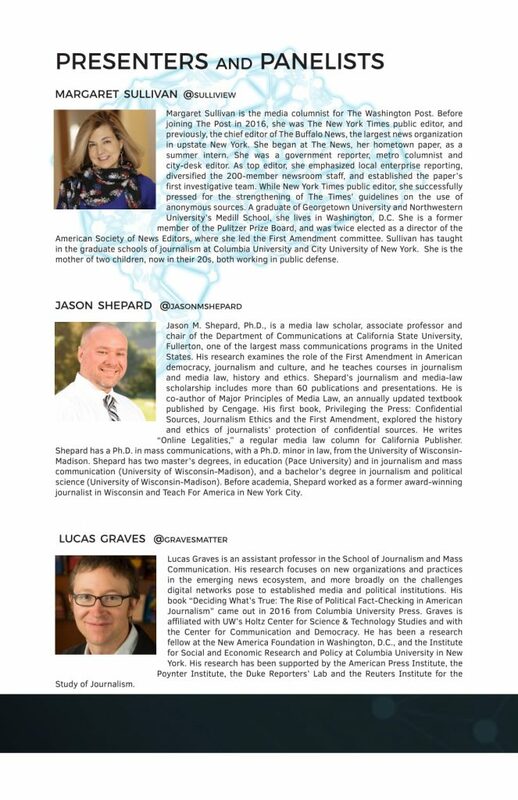 Bill Adair (PolitiFact), Lucas Graves (Columbia University) and Lisa Graves (Executive Director, Center for Media & Democracy) discuss the rise of factchecking and what its emergence says about the larger field of news media. 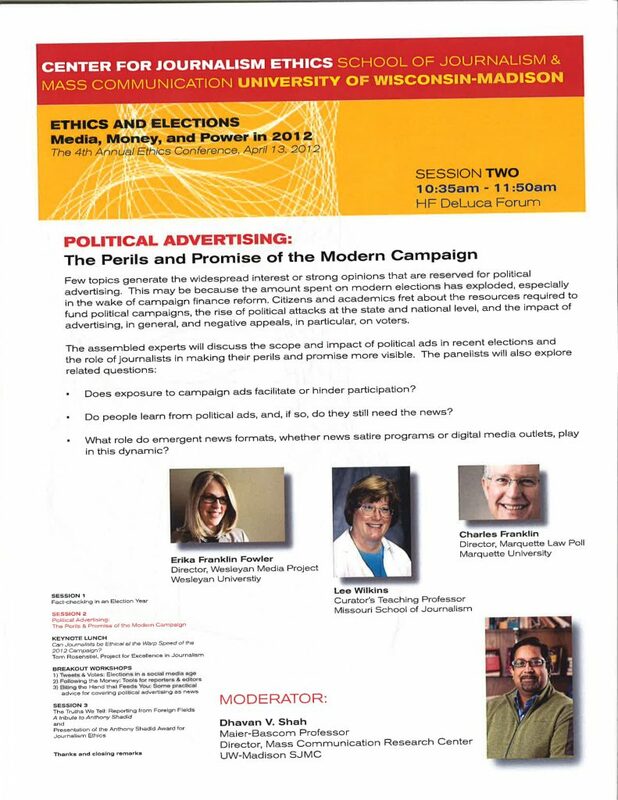 Erika Franklin Fowler (Director, Wesleyan Media Project), Lee Wilkins (Missouri School of Journalism) and Charles Franklin (Director, Marquette Law Poll) discuss political advertising in the wake of campaign finance reform, focusing specifically on the scope and impact of political ads and the role of journalists. 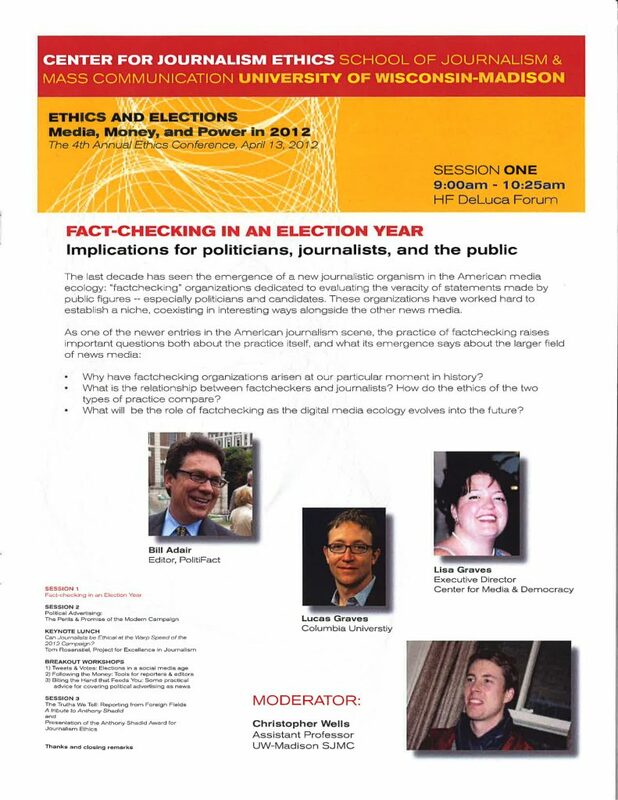 Kathleen Bartzen Culver (UW-Madison), Ryan Gallentine (Midwest Regional Director, Obama for Action), Thomas Keeley (Keeley Company) and Marc Smith (Connected Action Consulting) focus on the impact of social media on the 2012 election. 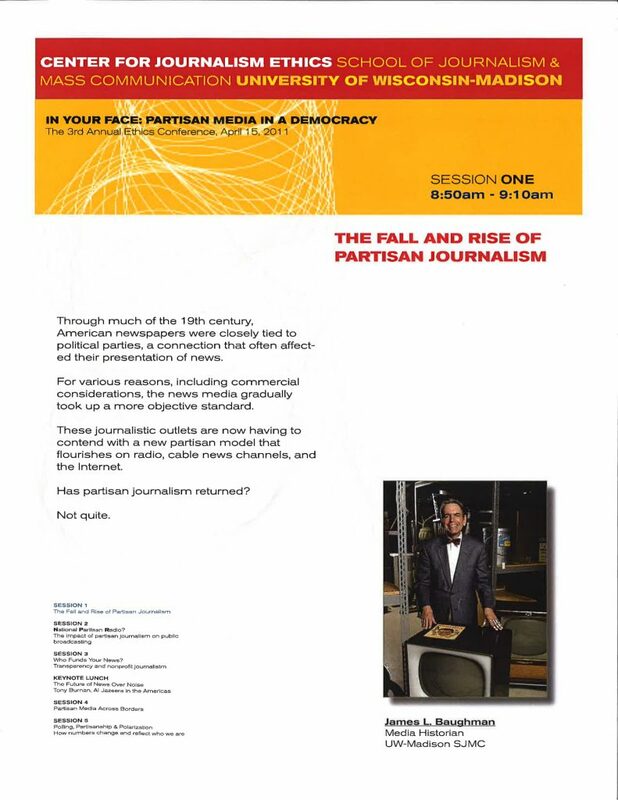 Media historian James L. Baughman discusses the 19th century history of partisan journalism and discusses whether or not it has returned. 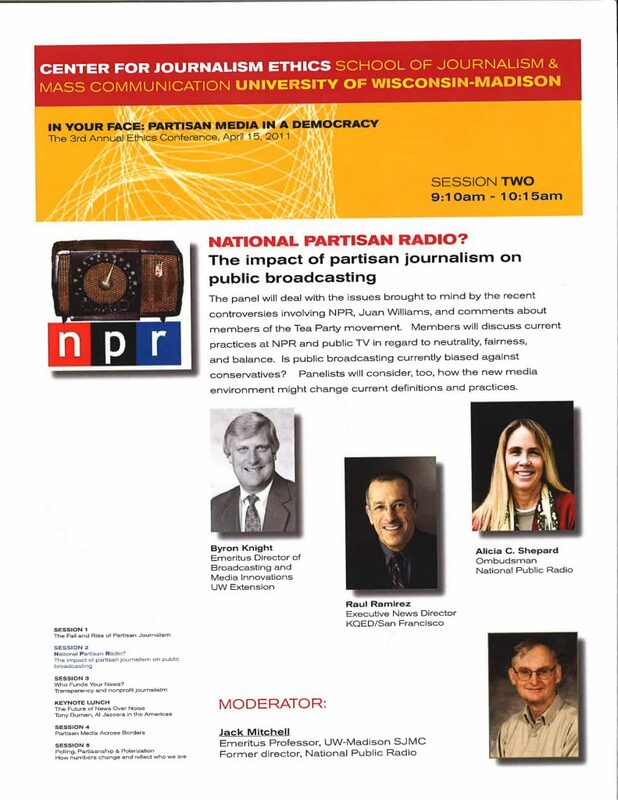 Panelists Byron Knight, Raul Ramirez, and Alicia C. Shepard discuss practices at NPR and public TV in regard to neutrality, fairness and balance. 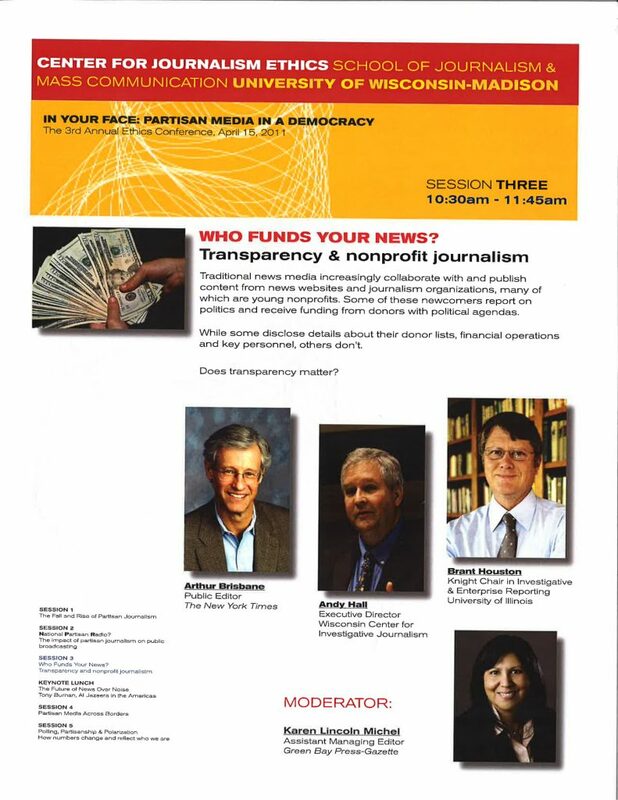 Panelists Arthur Brisbane, Andy Hall and Brant Houston discuss the importance of transparency in nonprofit news funding models. 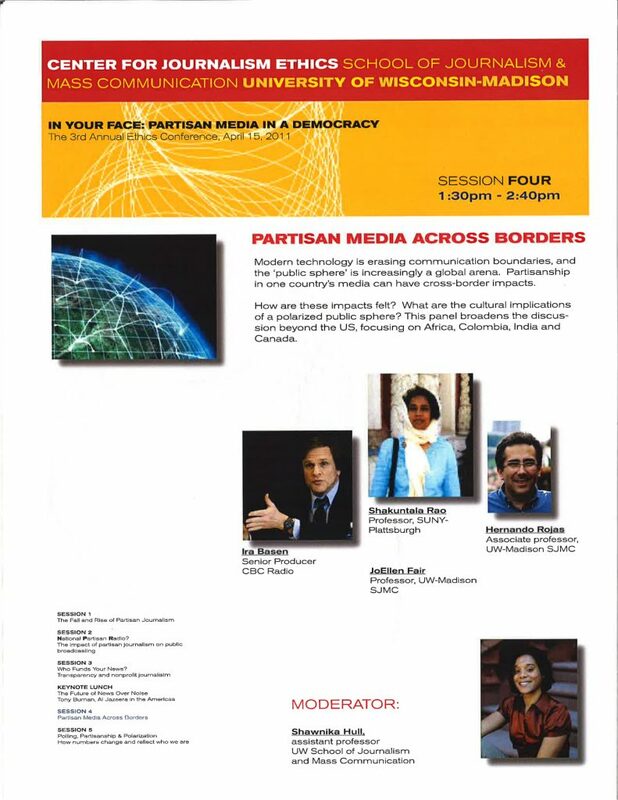 Panelists Ira Basen, Shakuntala Rao, Hernando Rojas and JoEllen Fair talk about how modern technology is erasing communication boundaries and the “public sphere” is increasingly a global arena. 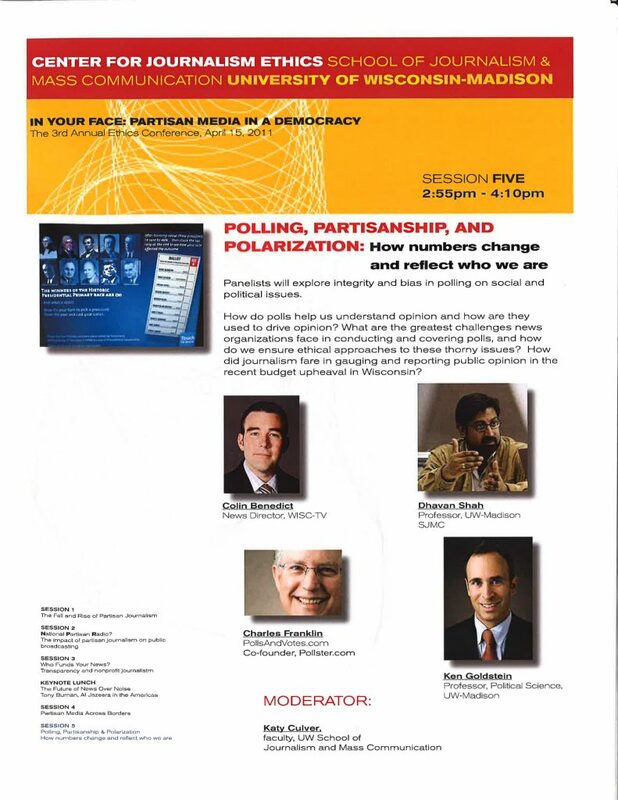 Panelists Colin Benedict, Dhavan Shah, Charles Franklin and Ken Goldstein explore integrity and bias in polling on social and political issues. 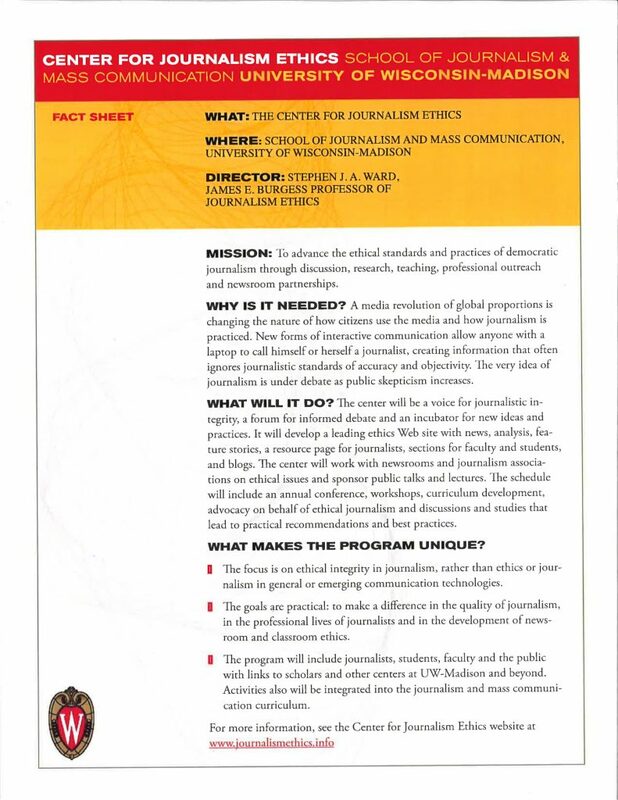 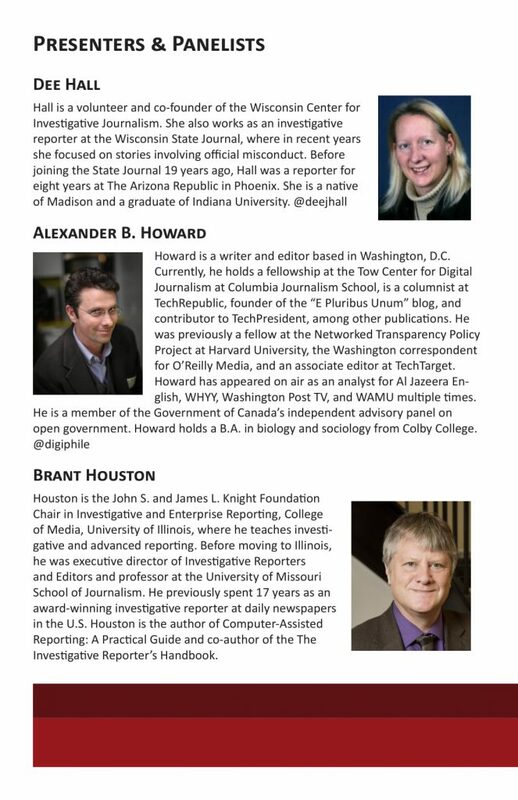 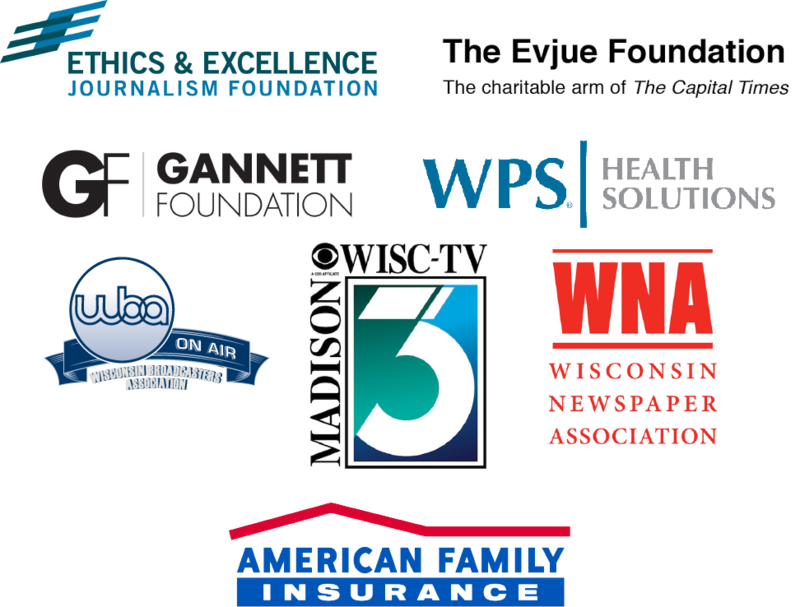 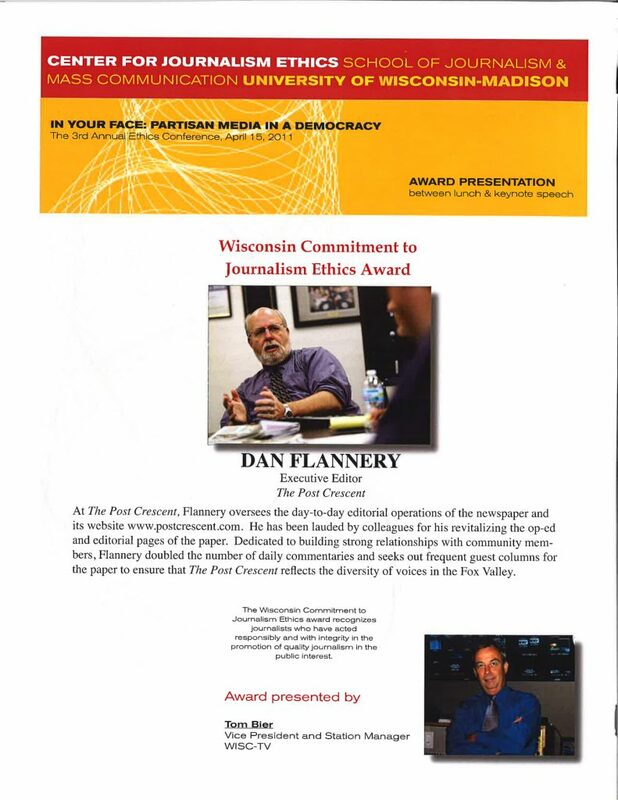 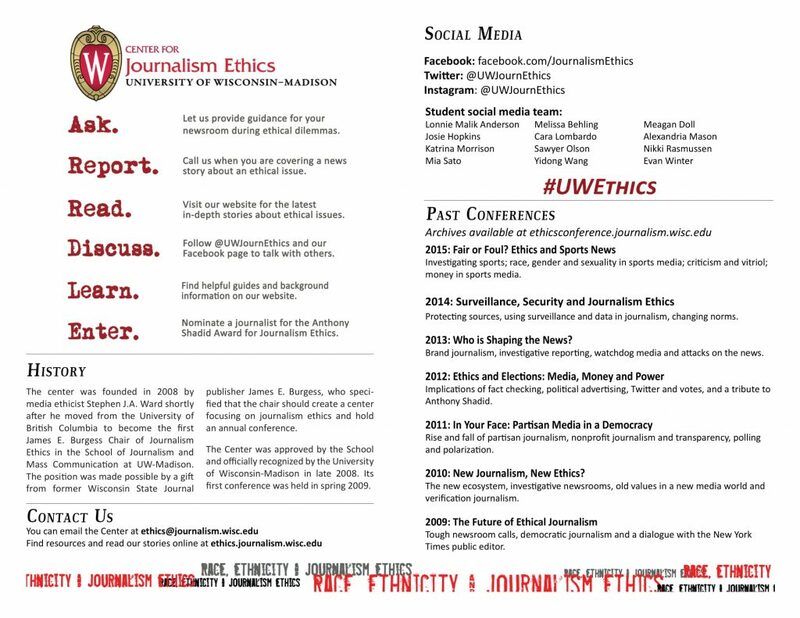 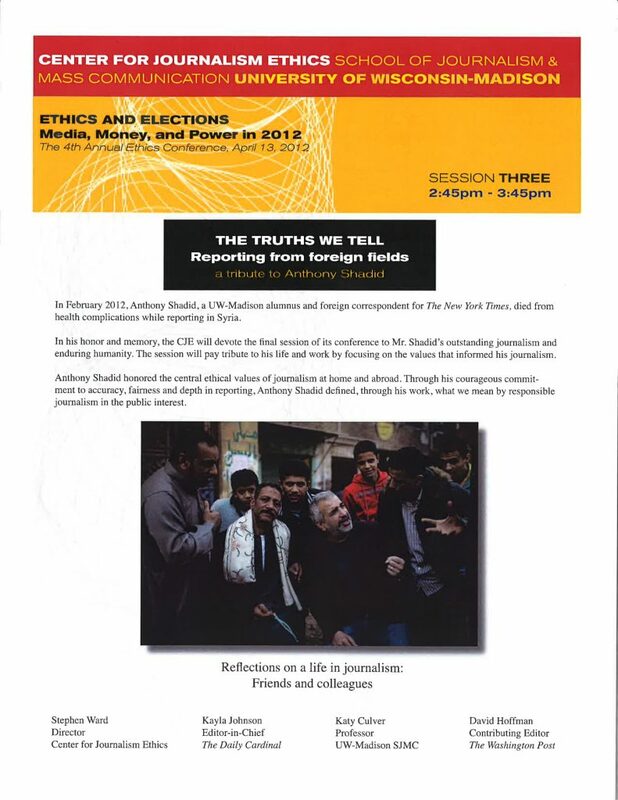 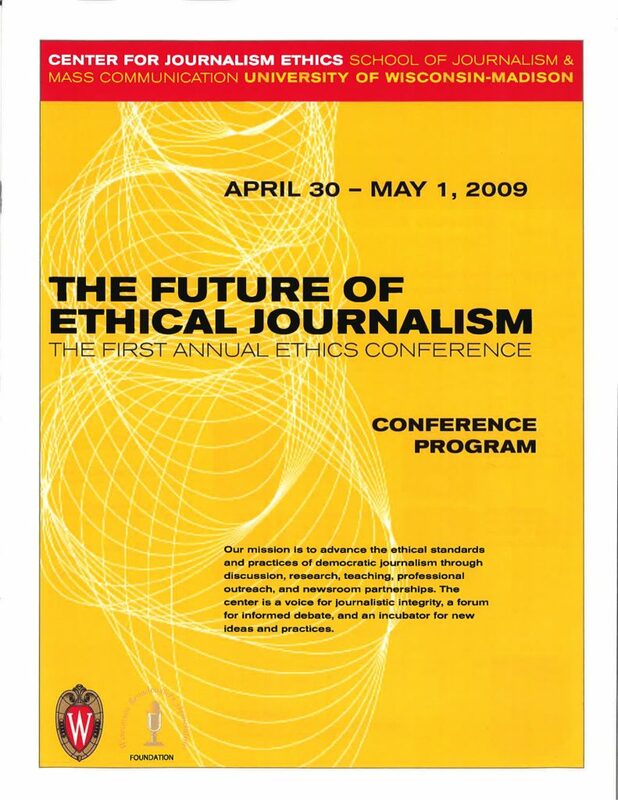 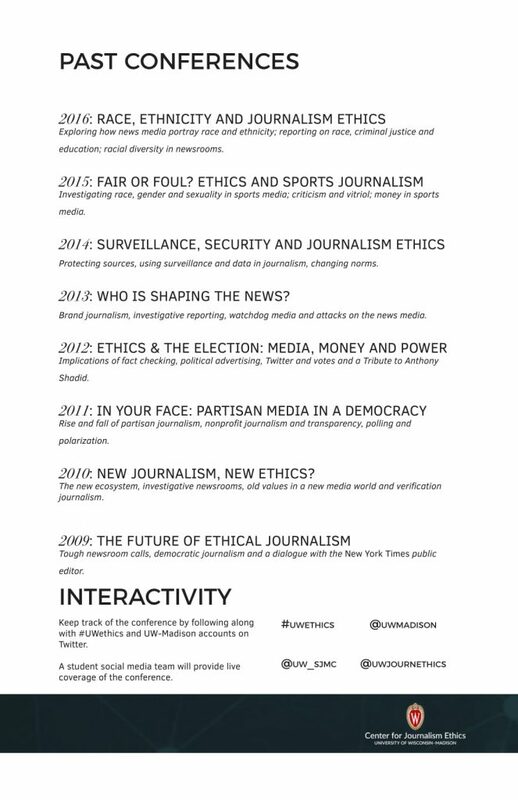 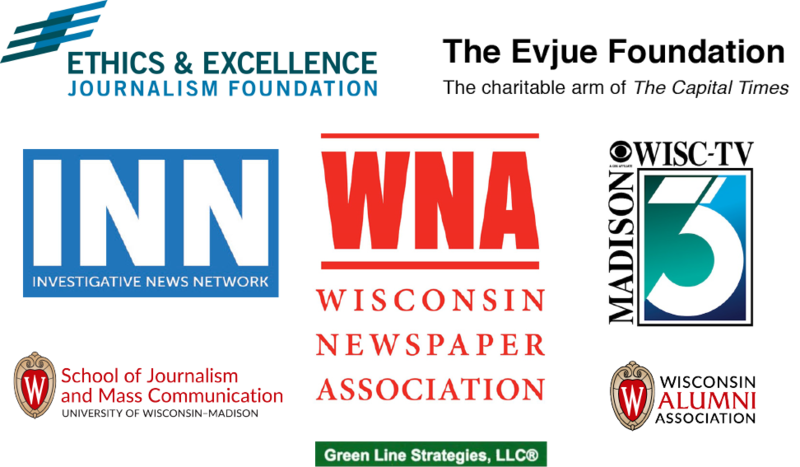 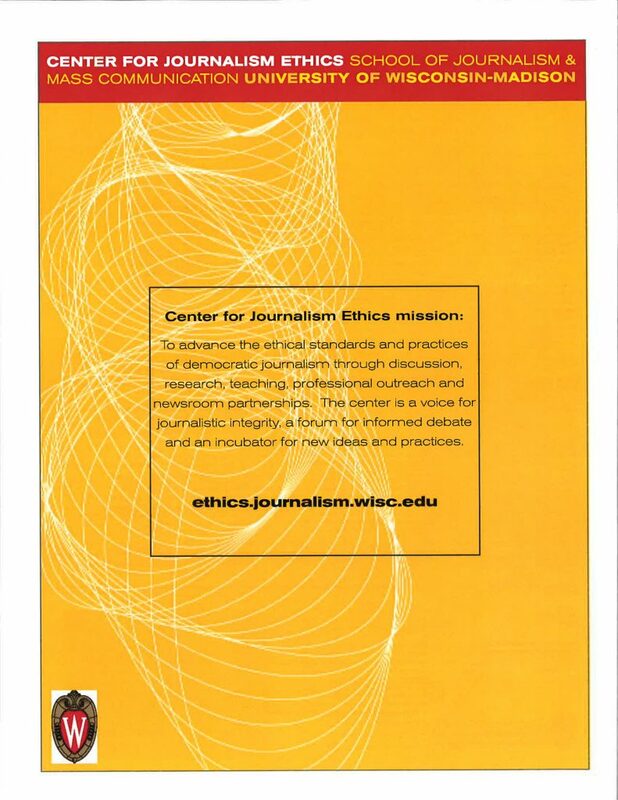 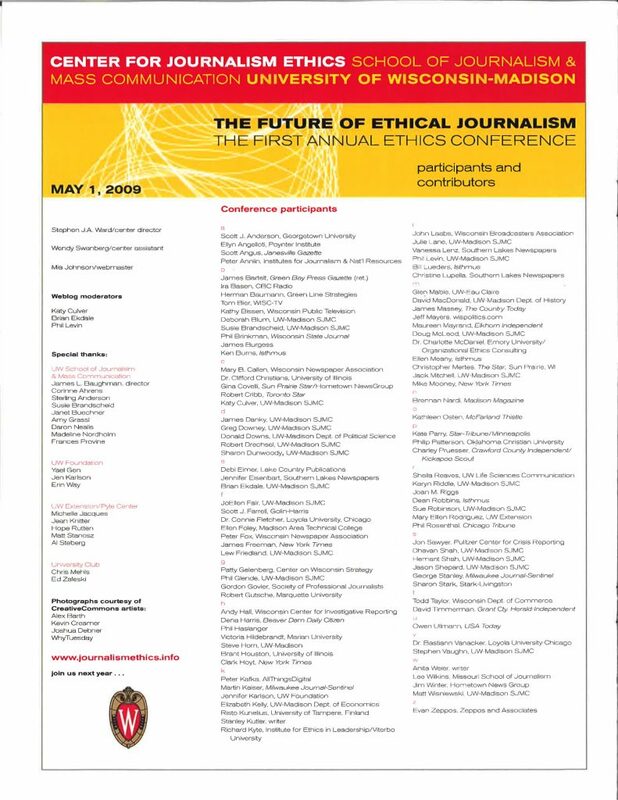 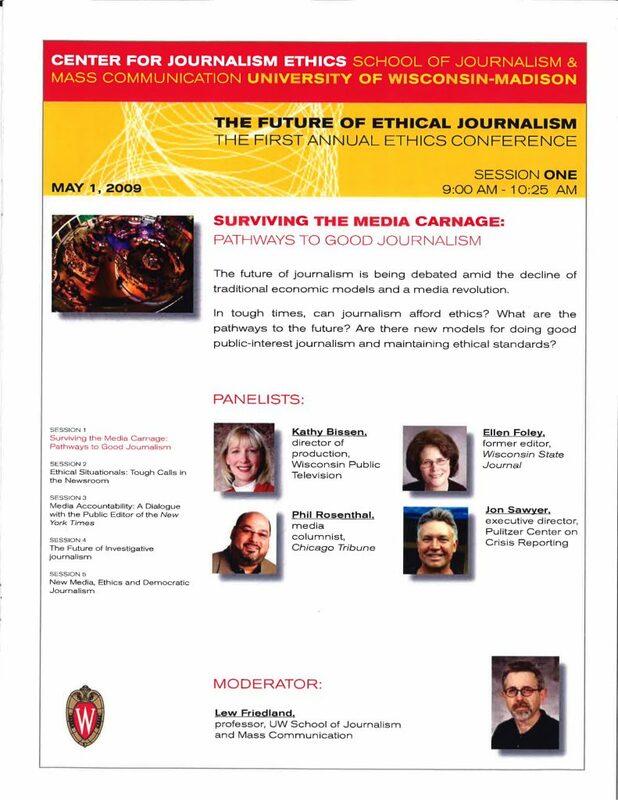 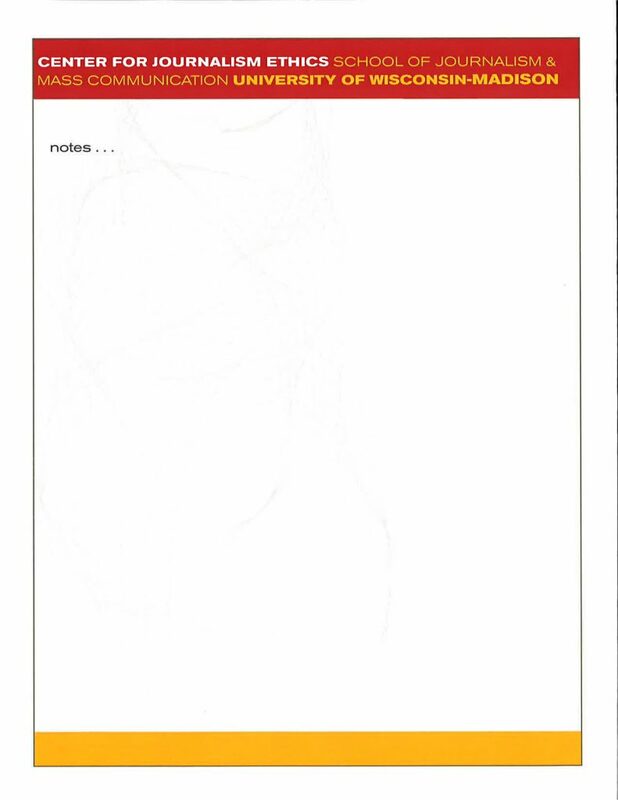 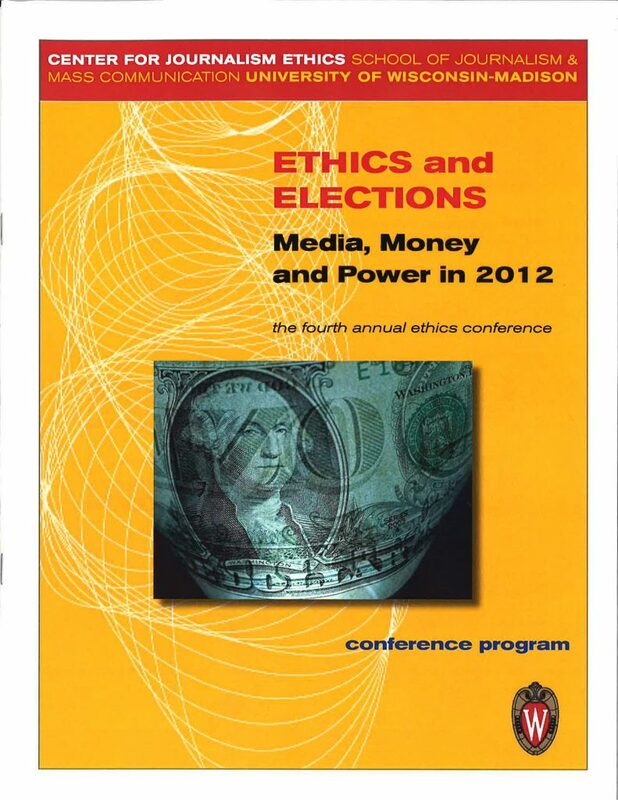 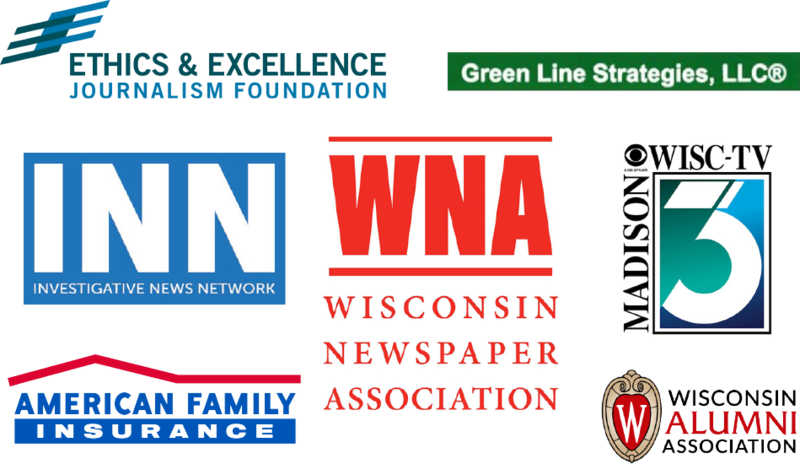 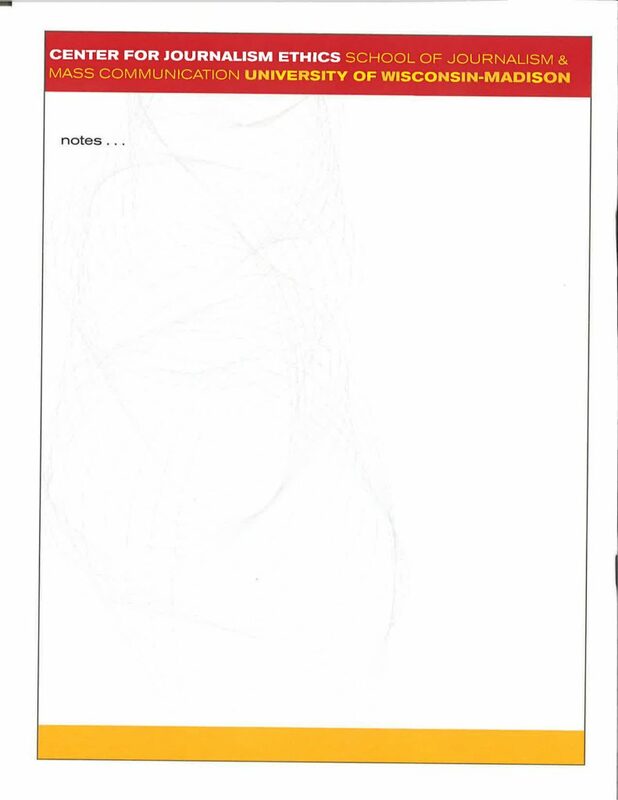 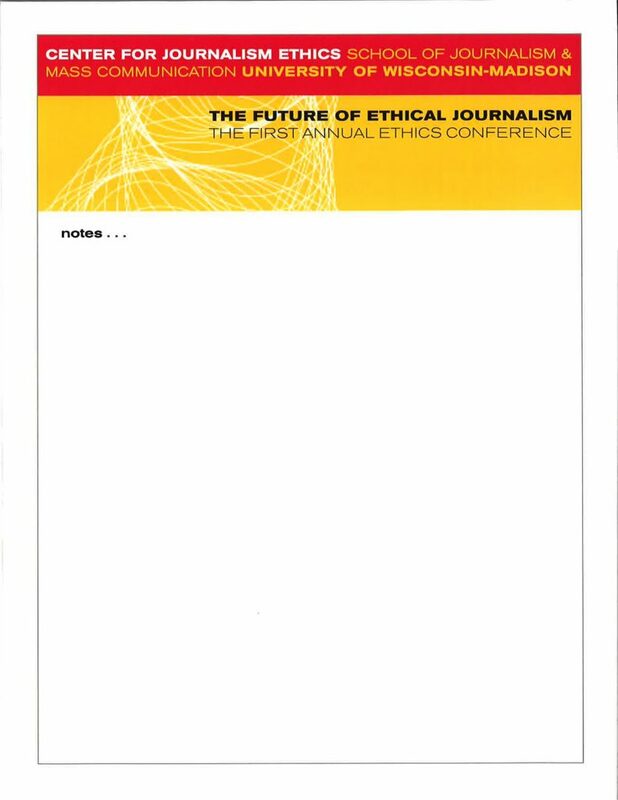 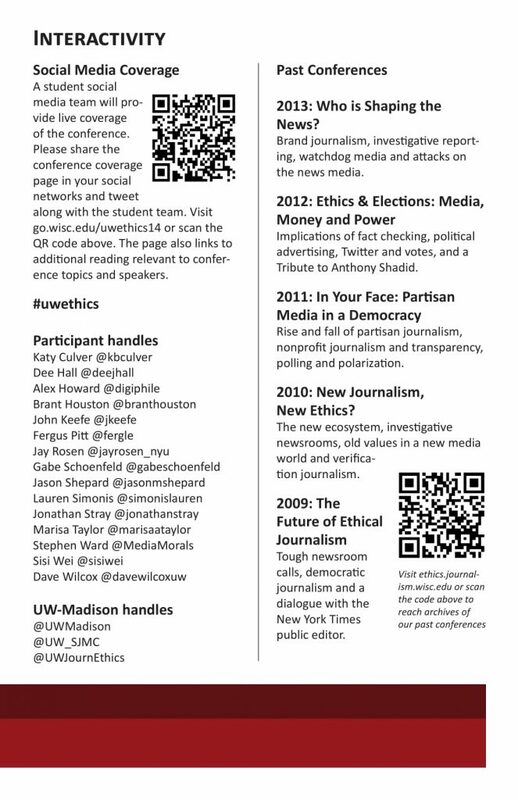 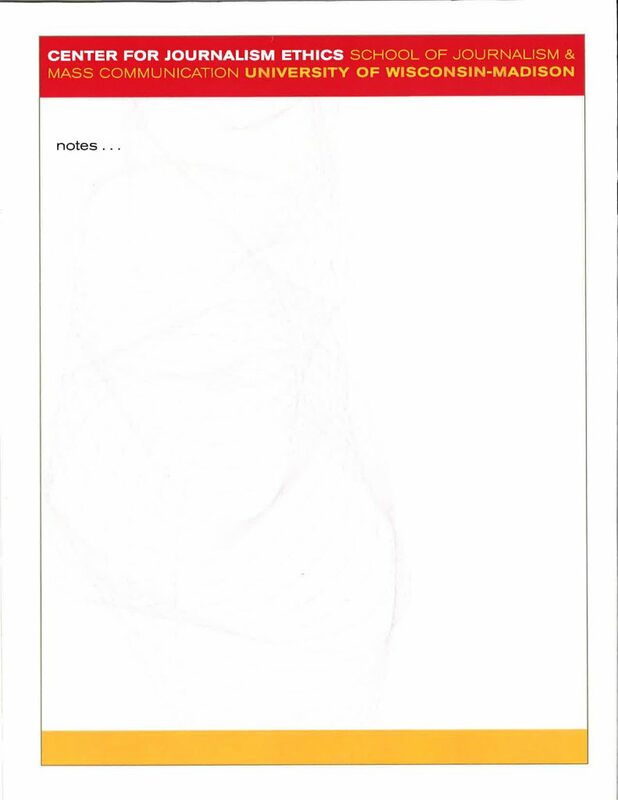 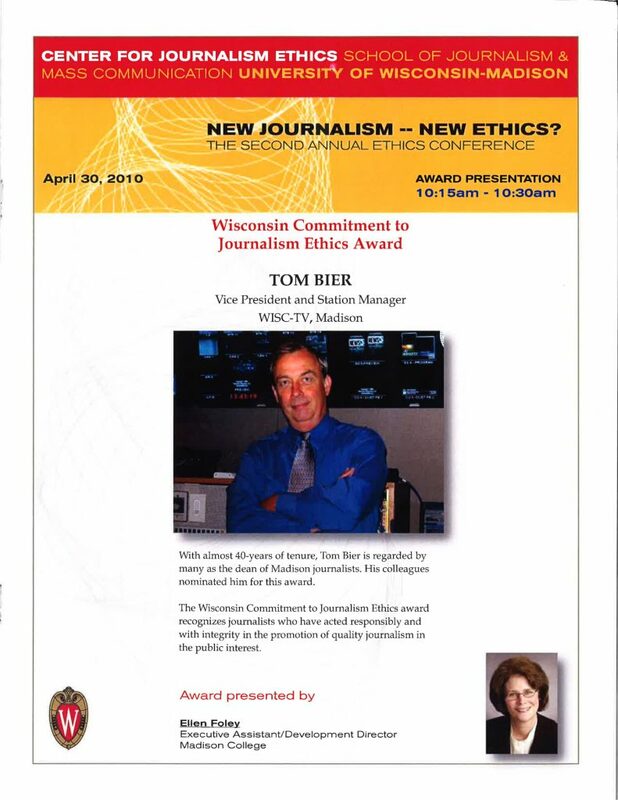 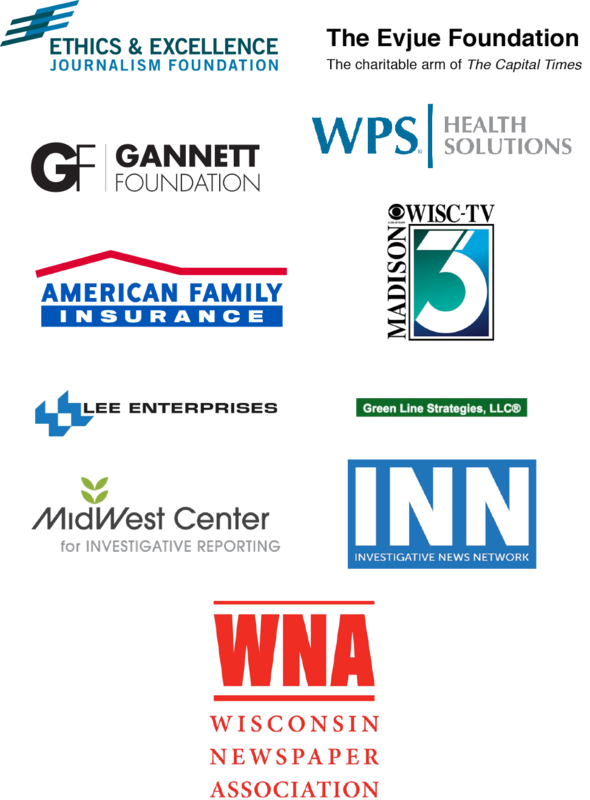 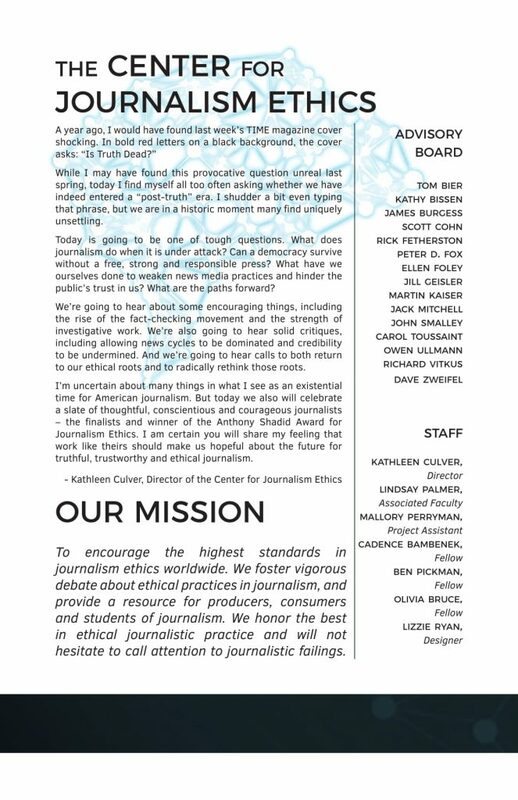 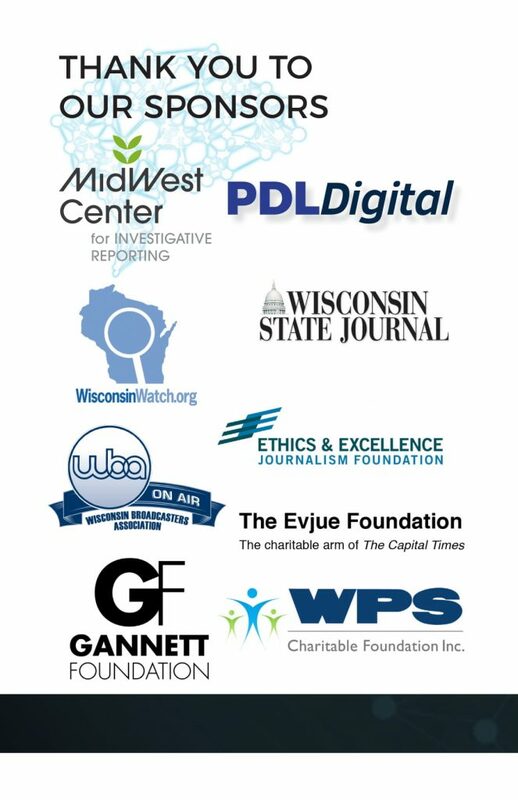 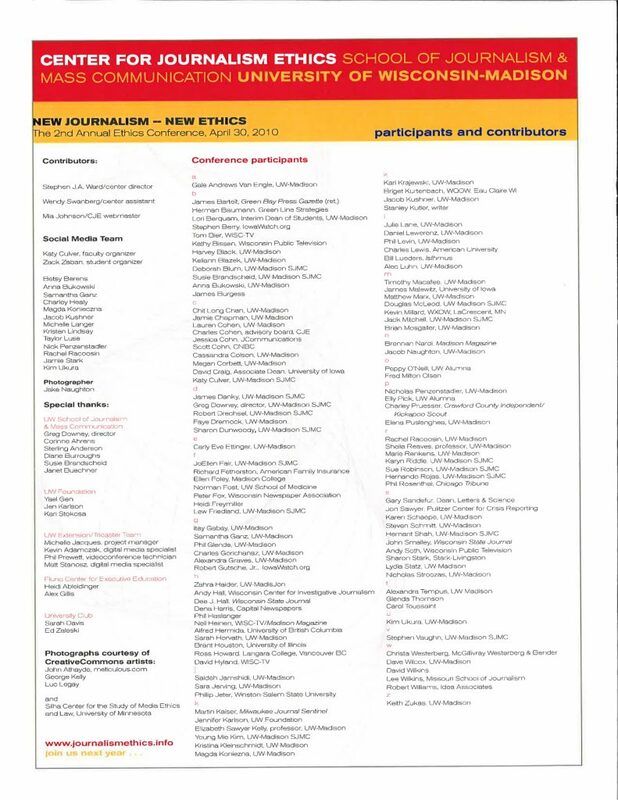 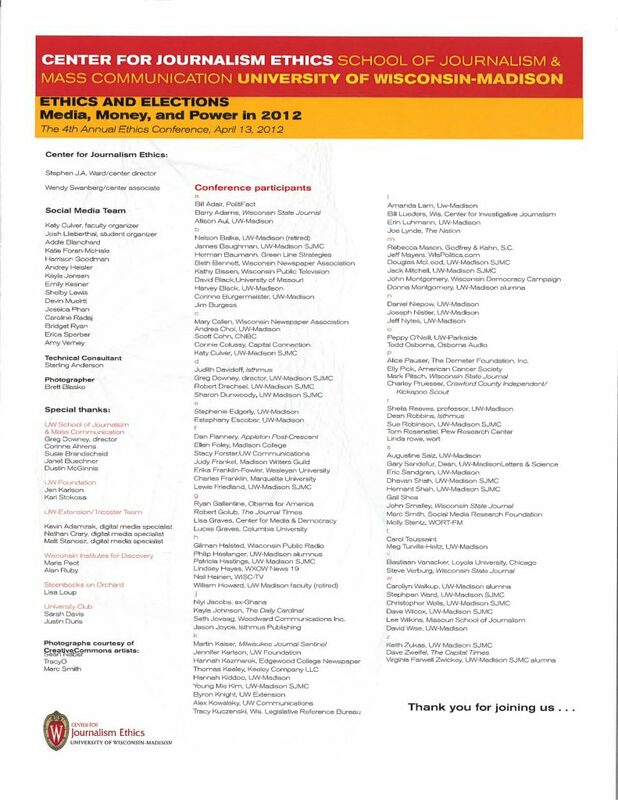 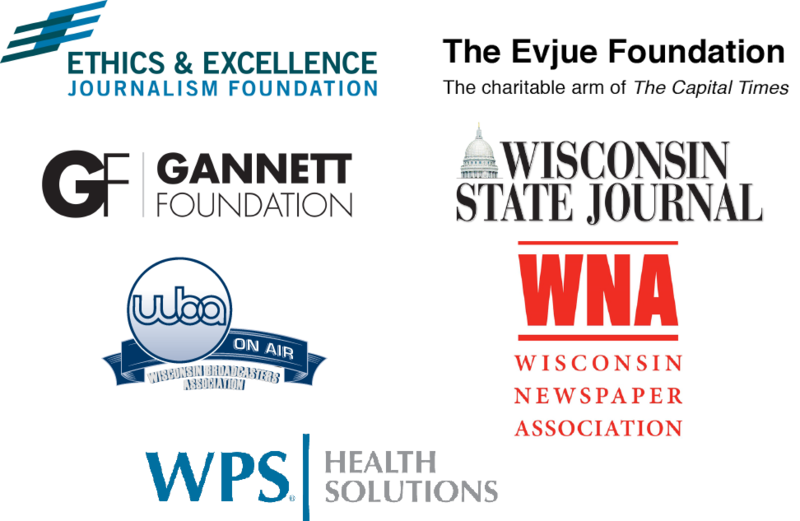 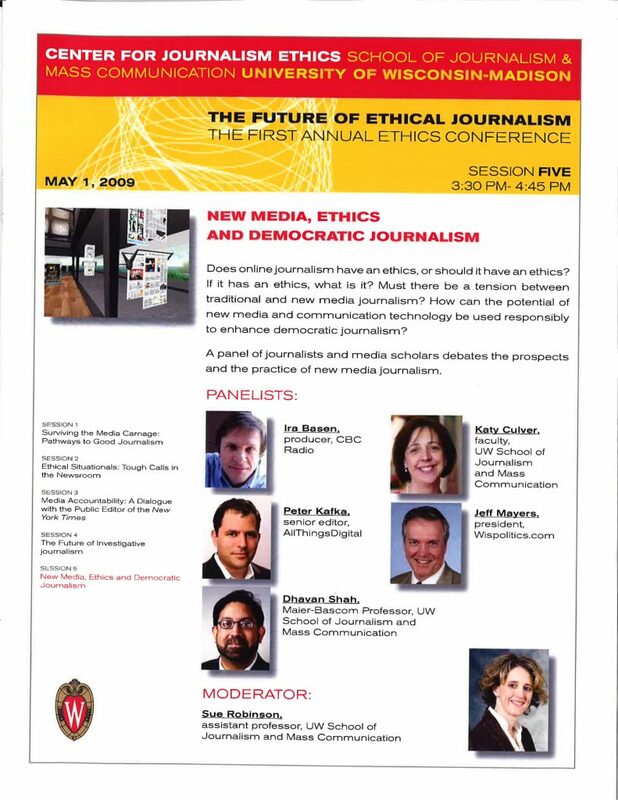 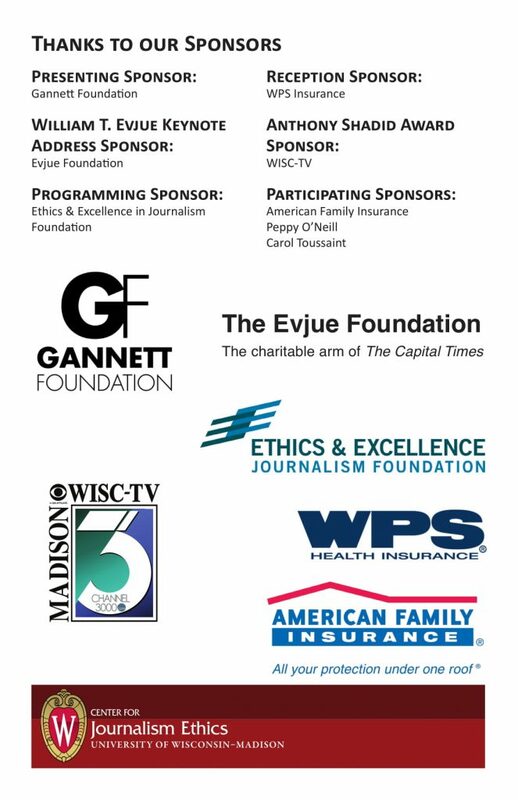 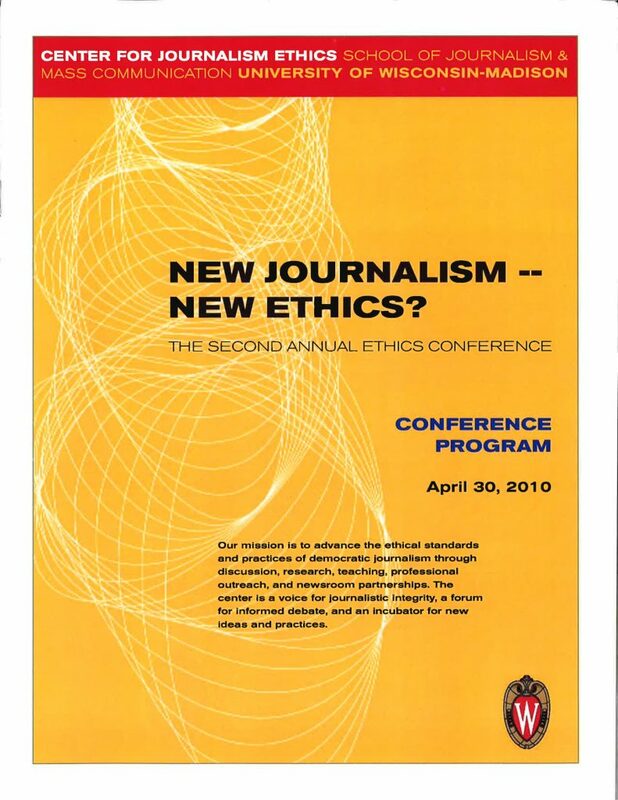 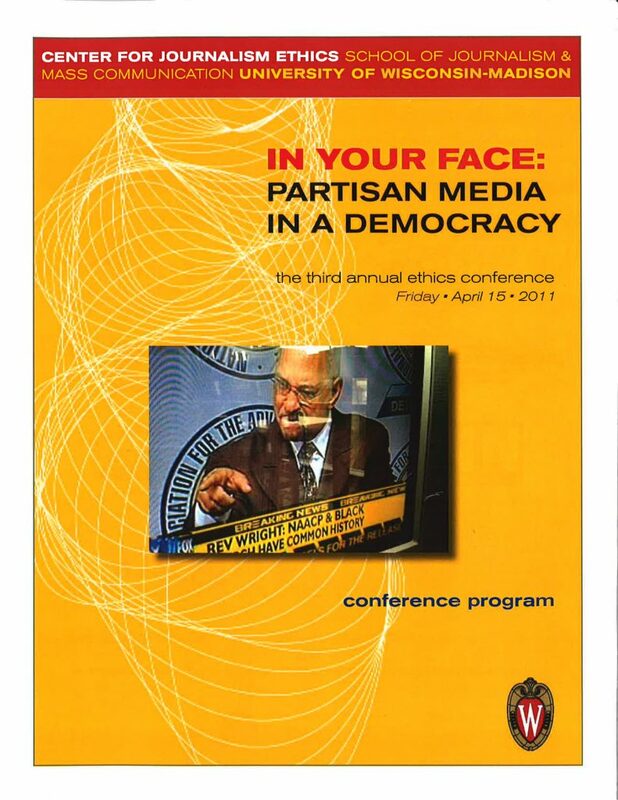 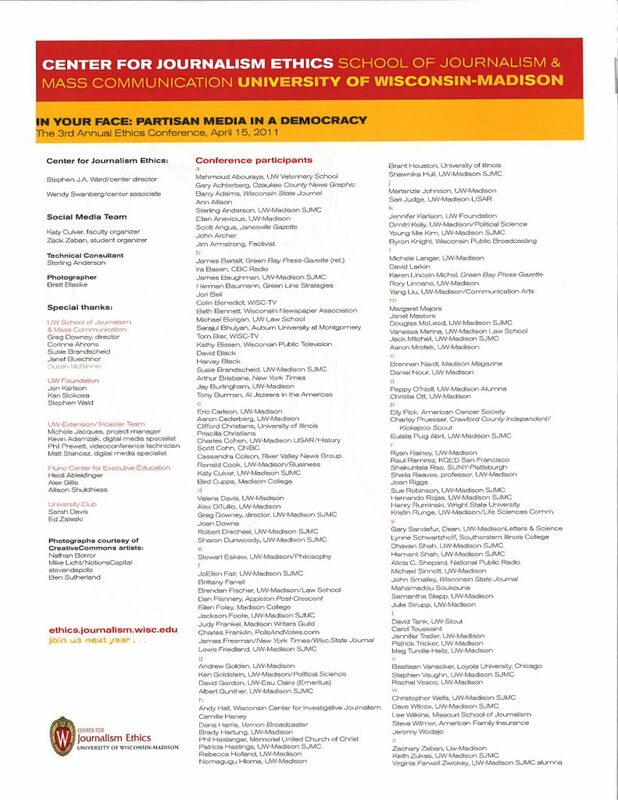 2010: New Journalism, New Ethics? 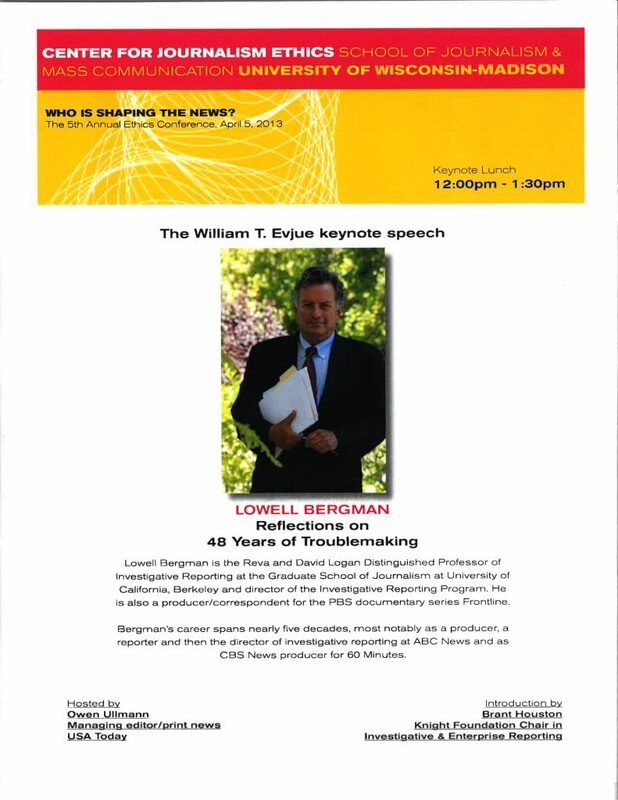 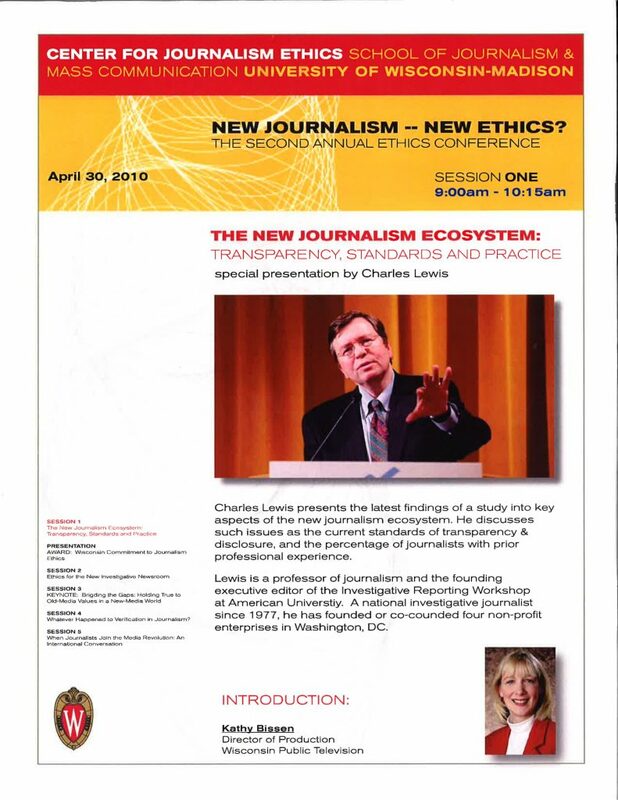 Charles Lewis, Executive Editor of the Investigative Reporting Workshop at American University, discusses current standards of transparency and disclosure, and the percentage of journalists with prior professional experience. 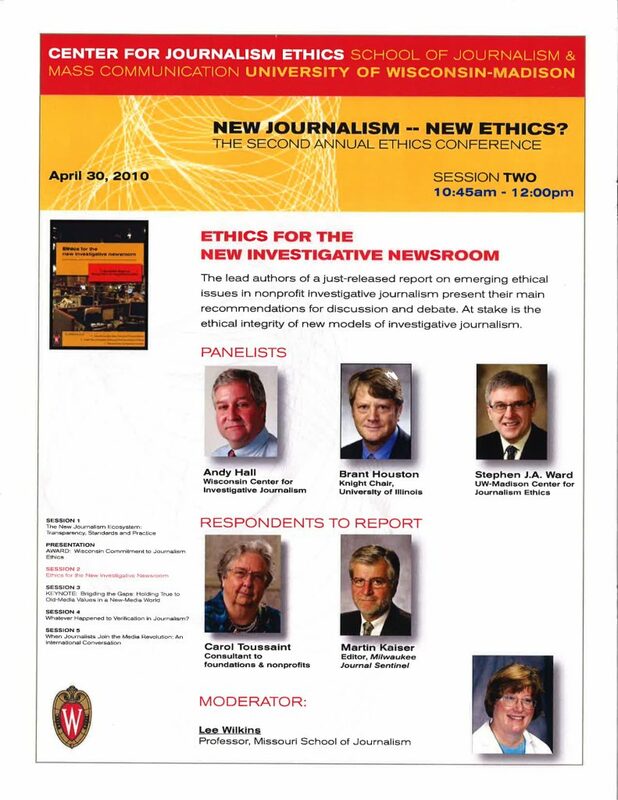 Panelists Andy Hall, Brant Houston, Stephen JA Ward, Carol Toussaint and Marty Kaiser present their findings on emerging ethical issues in nonprofit investigative journalism. 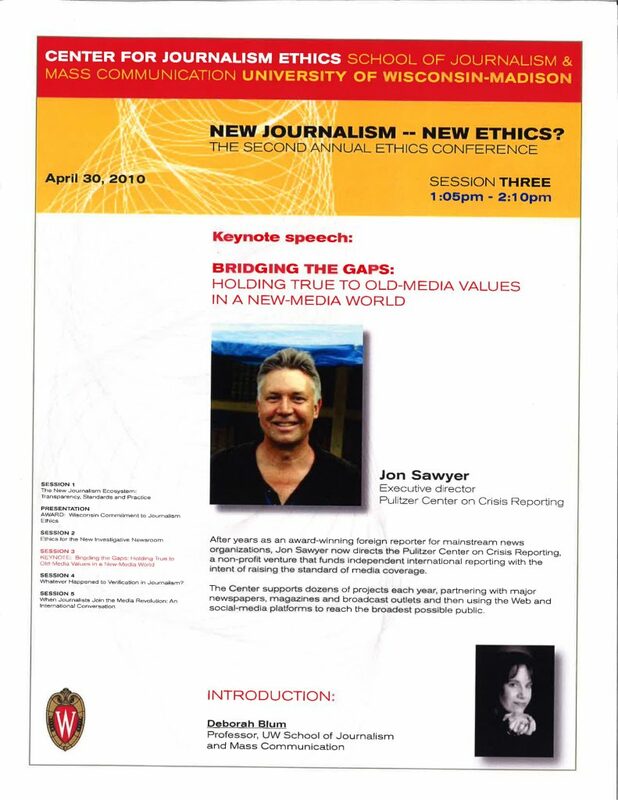 Jon Sawyer, executive director of the Pulitzer Center on Crisis Reporting, delivers the conference’s keynote address. 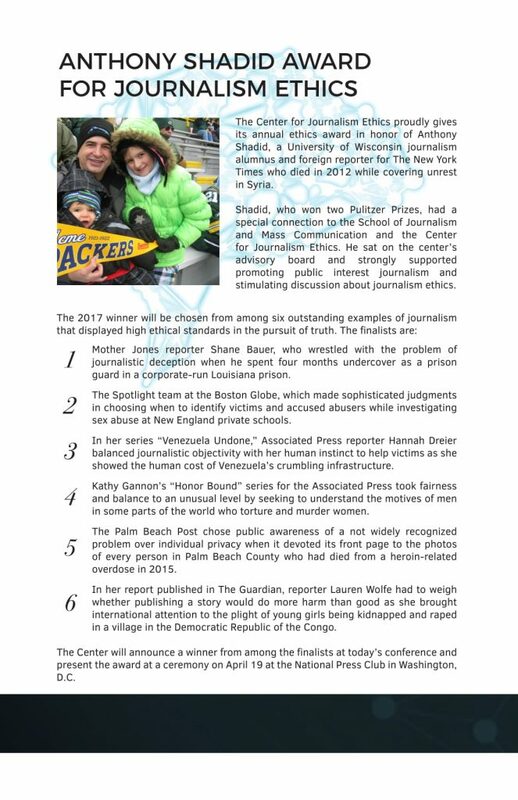 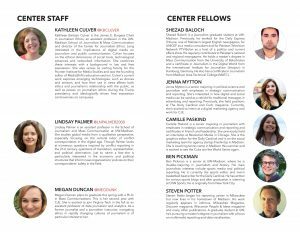 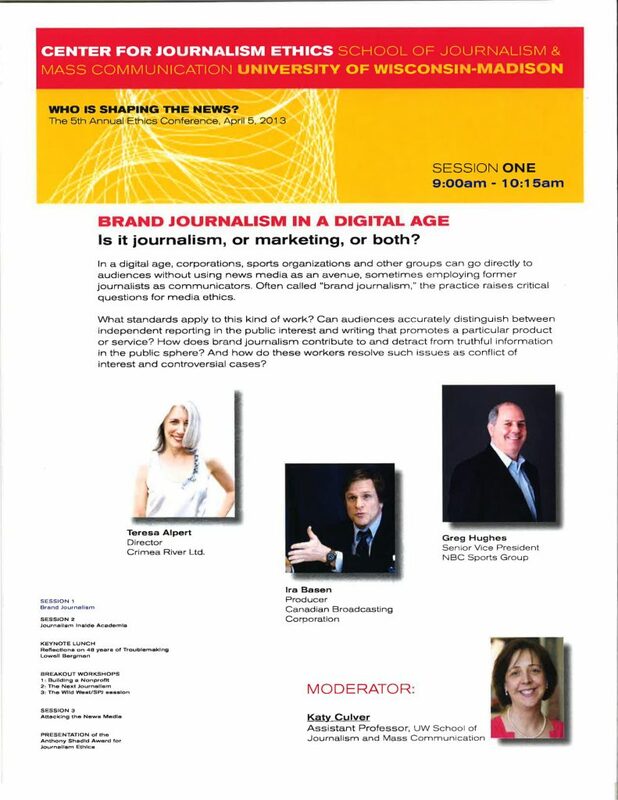 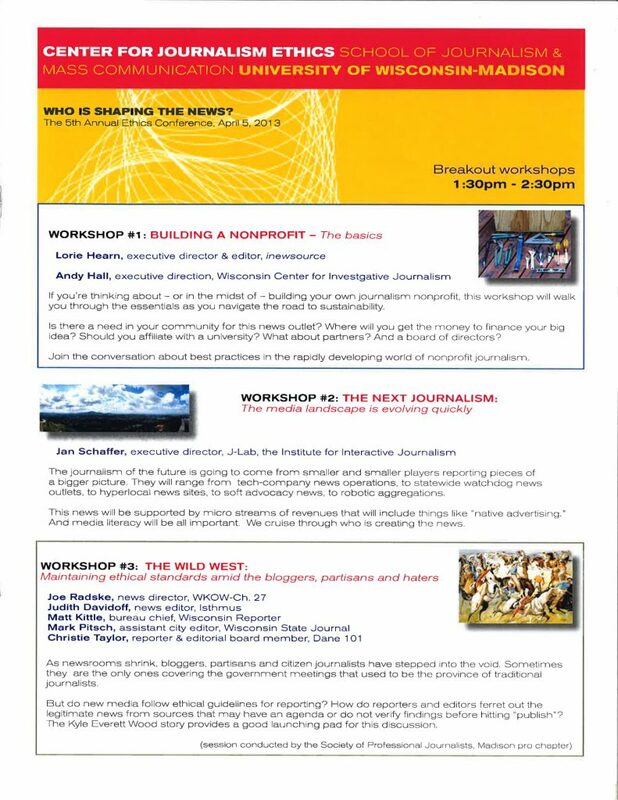 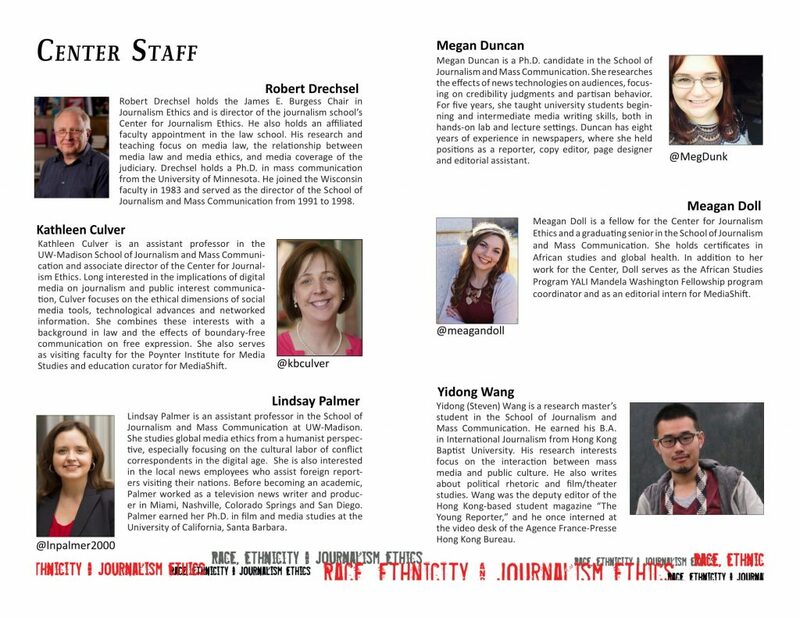 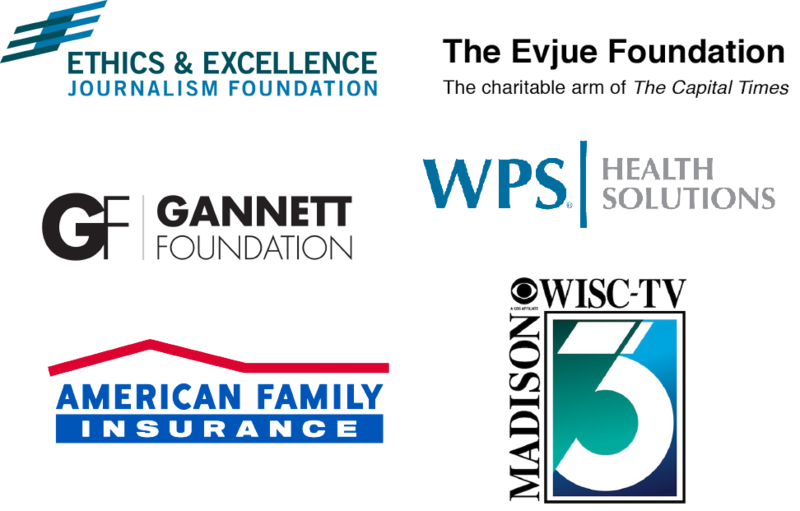 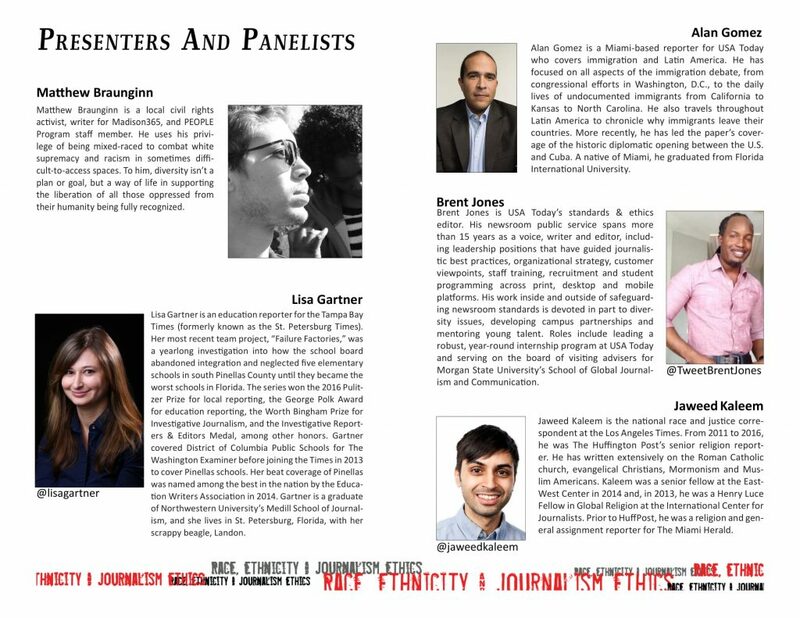 Session 4 – Whatever Happened to Verification in Journalism? 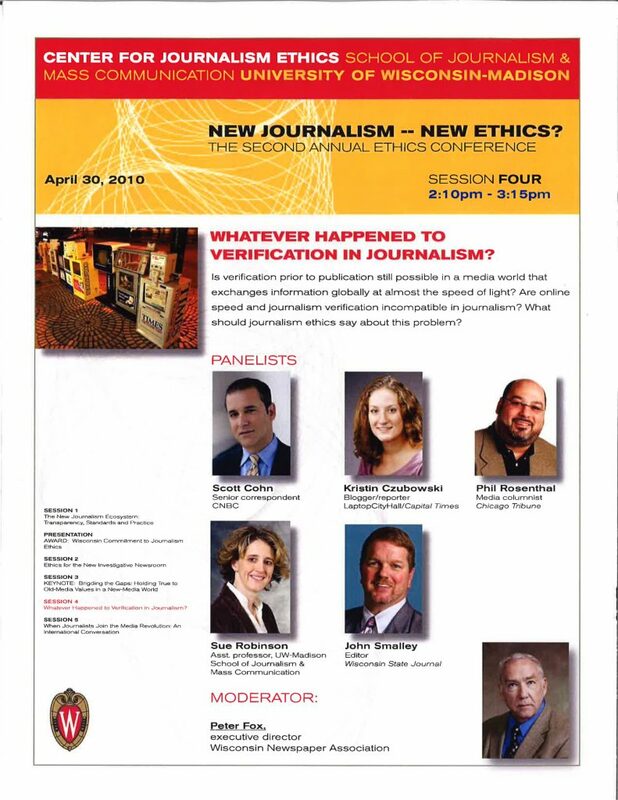 Panelists Scott Cohn, Kristin Czubowski, Phil Rosenthal, Sue Robinson and John Smalley discuss whether journalism verification and online speed are compatible values. 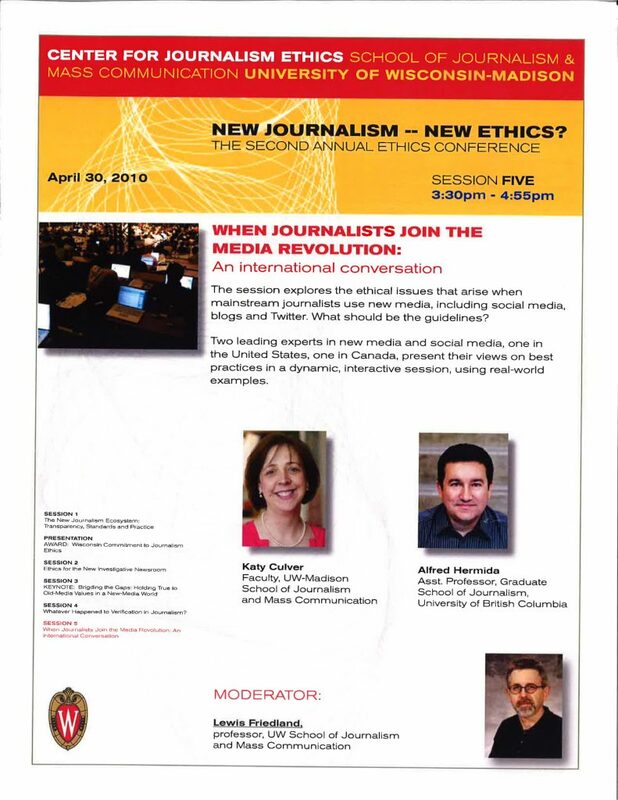 Kathleen Bartzen Culver speaks with Alfred Hermida about the ethical issues arising when mainstream journalists use new media, including social media, blogs and Twitter. 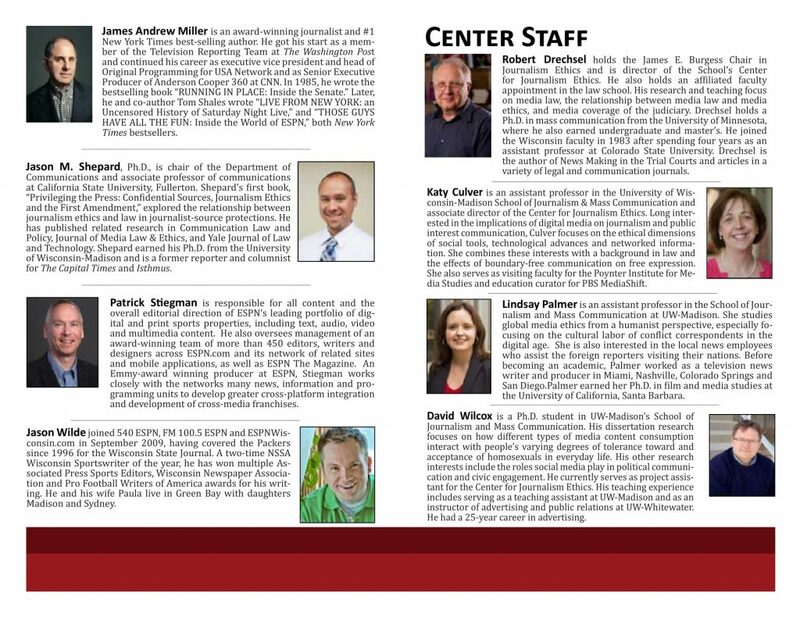 Center Director Stephen J.A. 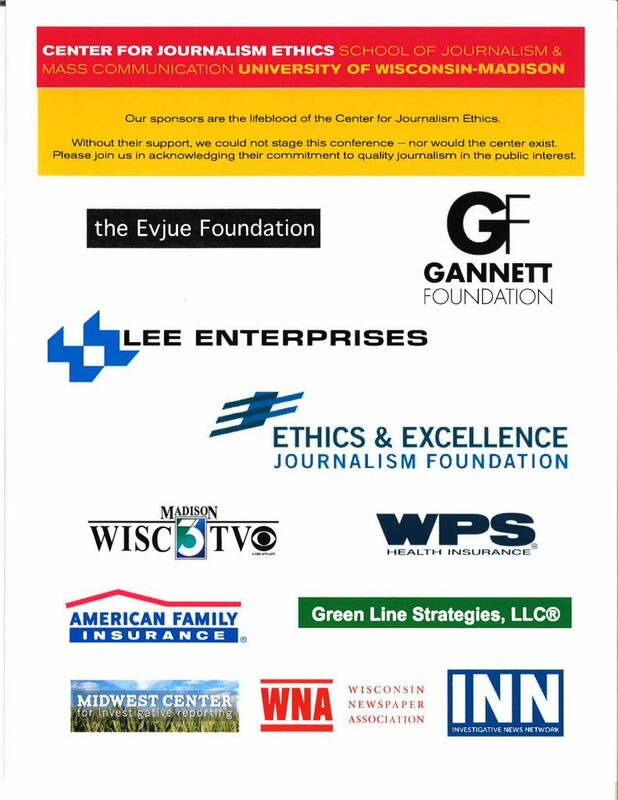 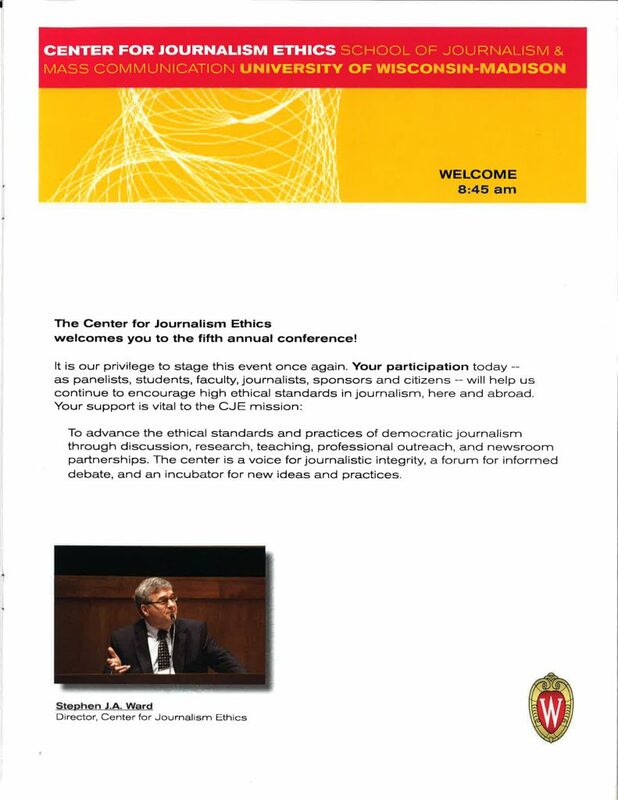 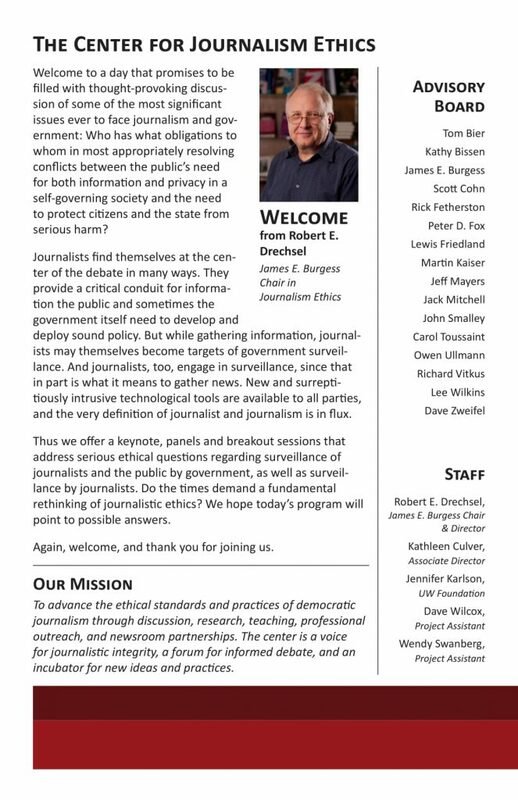 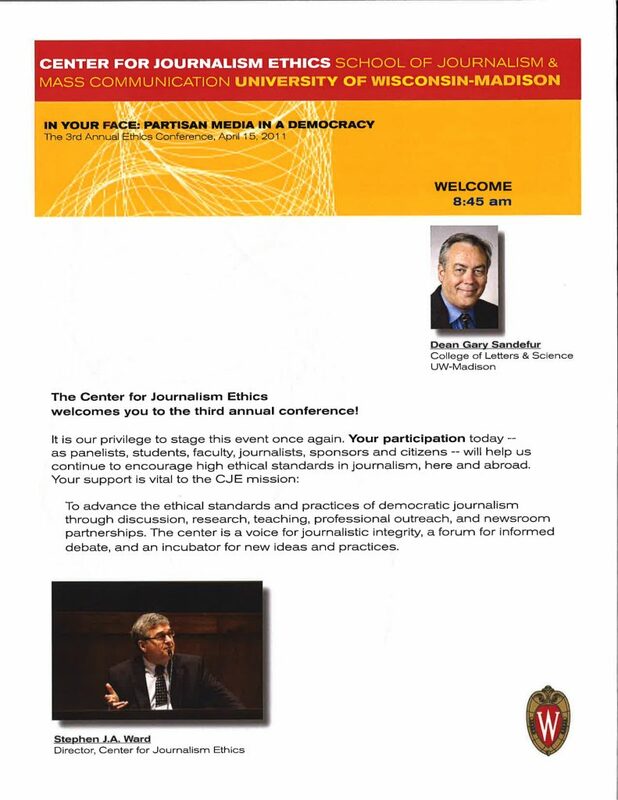 Ward gives the welcoming introduction to the Center for Journalism Ethics’ first conference. 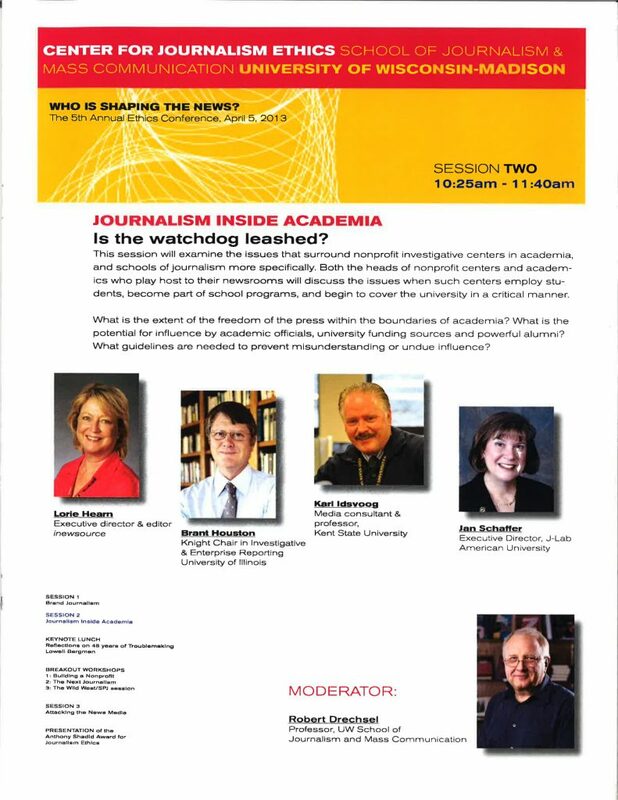 Panelists Kathy Bissen, Ellen Foley, Phil Rosenthal and Jon Sawyer discuss the decline of traditional economic models for journalism, future pathways and new models. 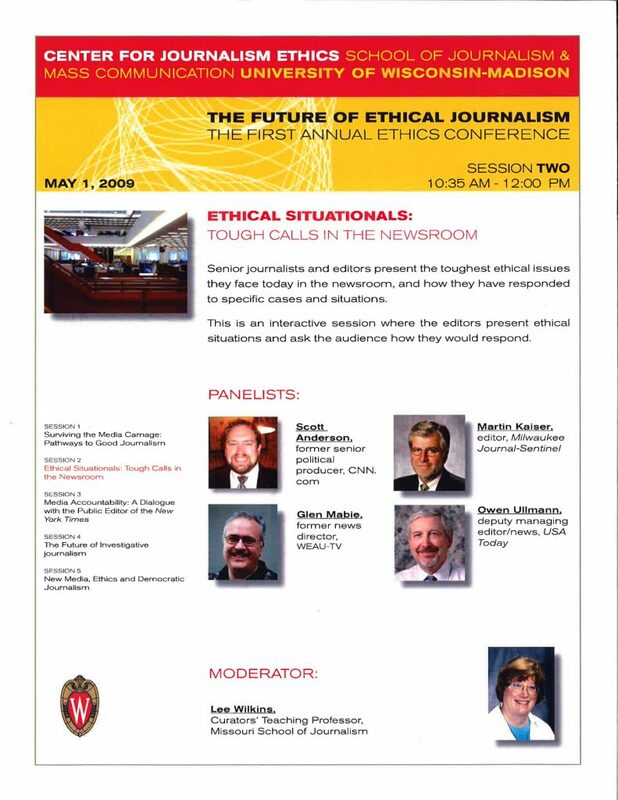 Panelists Scott Anderson, Martin Kaiser, Glen Mabie and Owen Ullmann talk about their toughest ethical challenges and how they’ve responded to specific cases and situations. 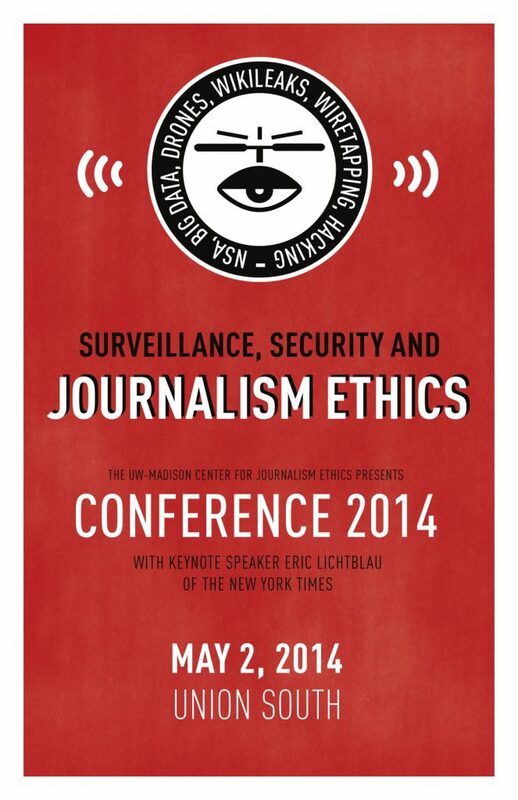 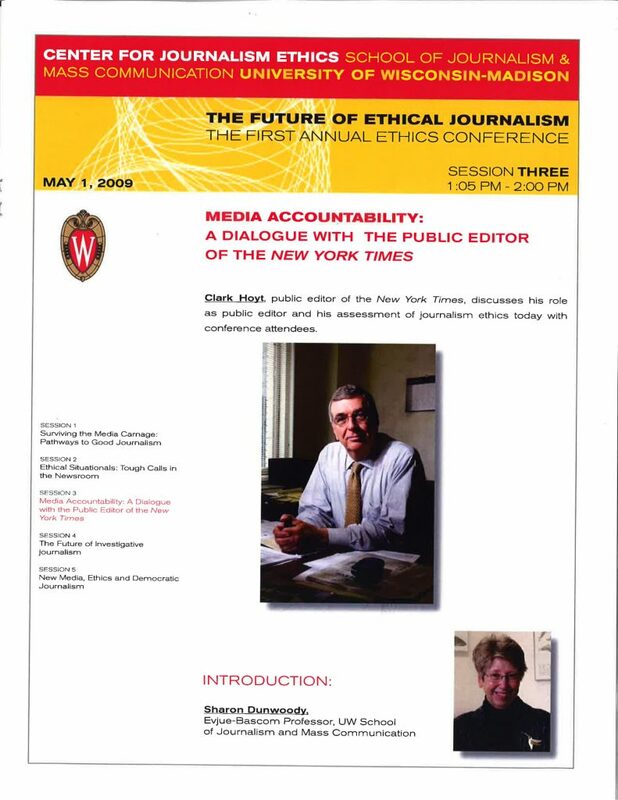 Clark Hoyt, public editor of the New York Times, discusses his role and his assessment of journalism ethics today. 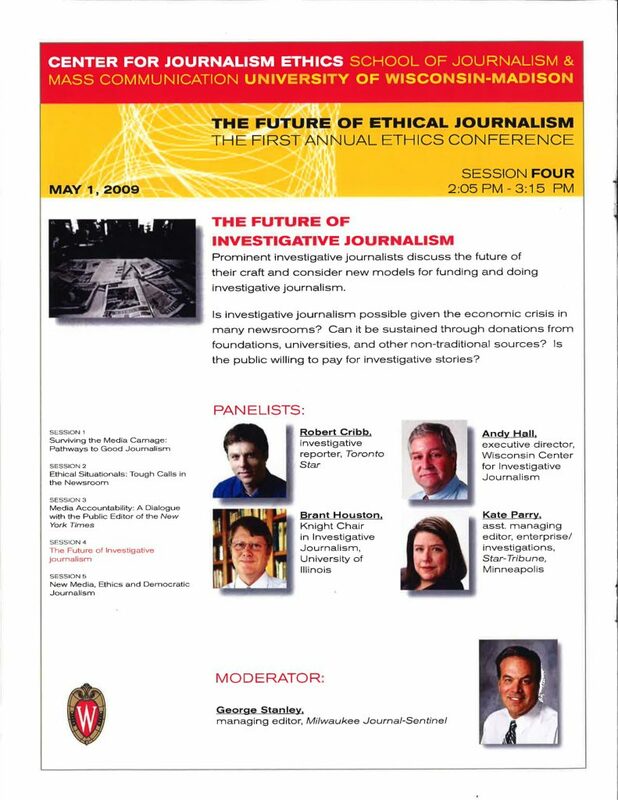 Panelists Robert Cribb, Andy Hall, Brant Houston and Kate Parry discuss the future of their craft and consider new models for funding investigative journalism.